It is officially the holiday season! 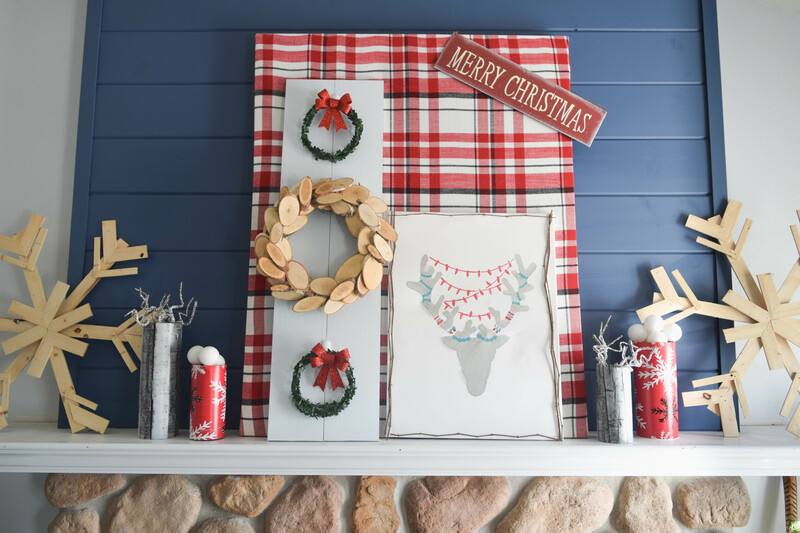 On Monday I will be sharing my Christmas home tour, but I am giving you the tiniest of sneak peeks today. 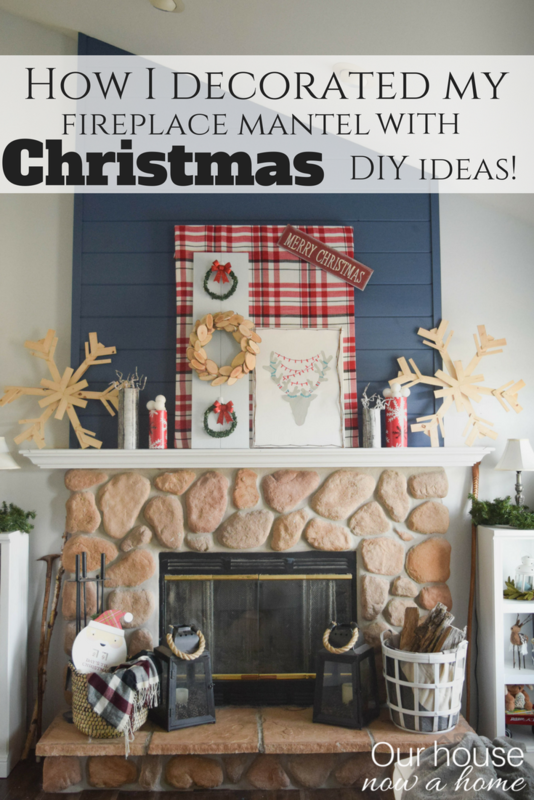 Holiday handmade – decorating a fireplace mantel with Christmas DIY ideas, pretty much I got my crafting on! 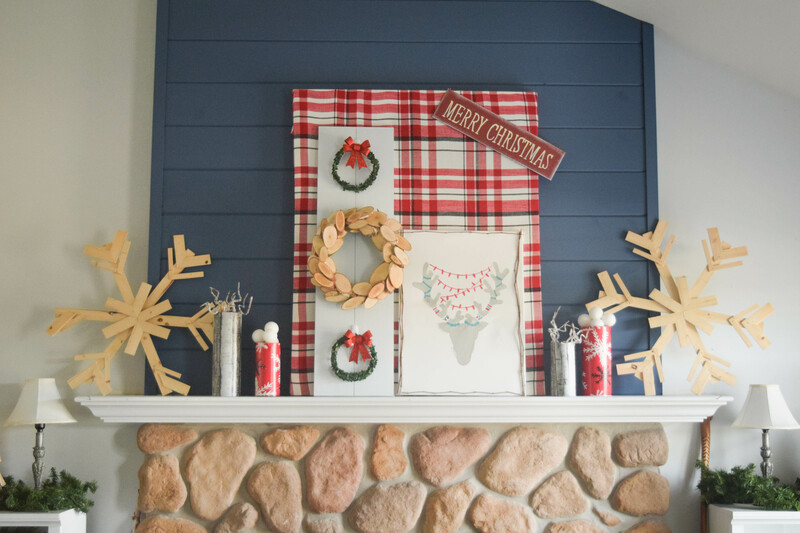 With the help of Joann’s Fabric and craft store I was able to get all of the supplies I needed to decorate my fireplace mantel. They have everything I needed to make my holiday fireplace mantel dreams come true. 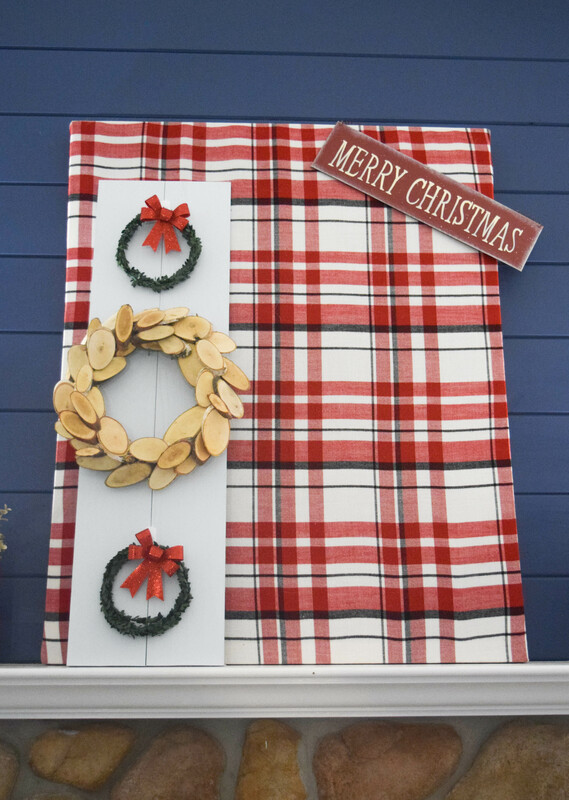 With the addition of the blue shiplap I felt like I was starting from scratch in terms of my holiday decorations. 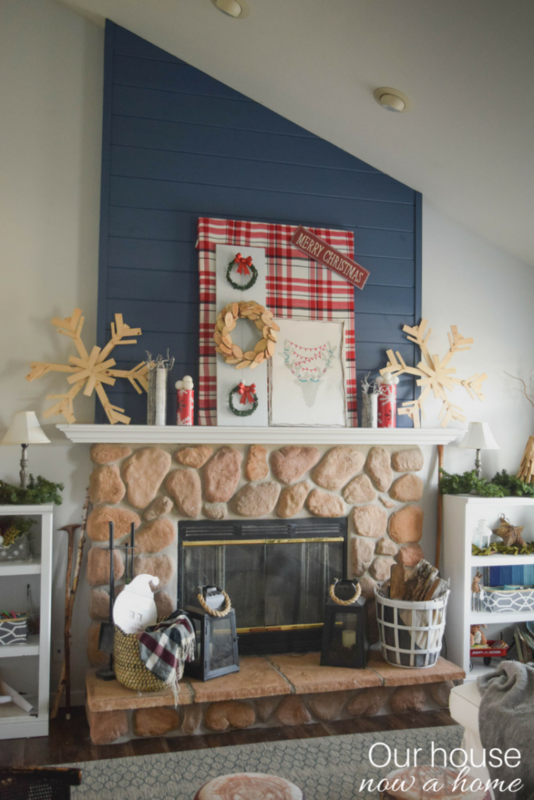 Last year I used a lot of blue in my decor, which would not work well with the existing navy blue color of the wood wall. 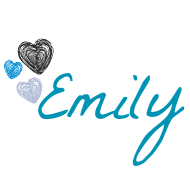 Which means toning down any blue. I decided on a red and white color scheme with pops of rustic wood to warm things up. 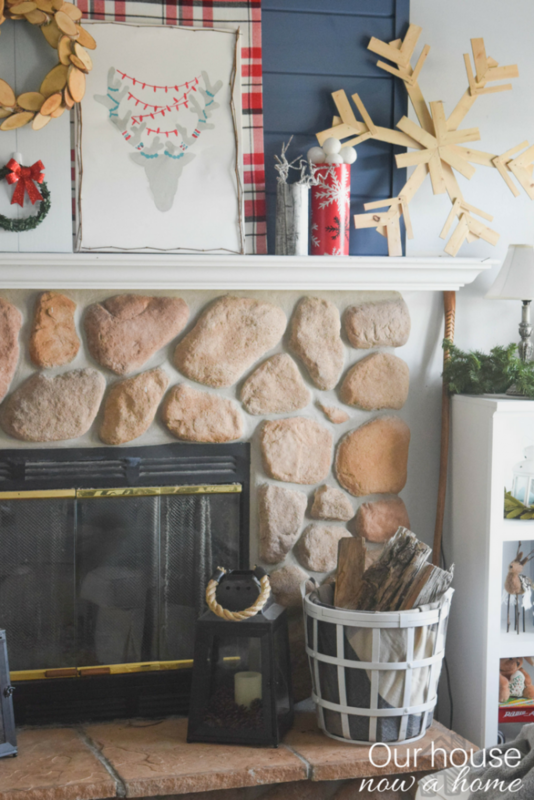 I packed a lot of smaller DIY projects into the decorating, blending in a few existing decor I already had or made in previous years to make my holiday fireplace mantel become what I wanted. 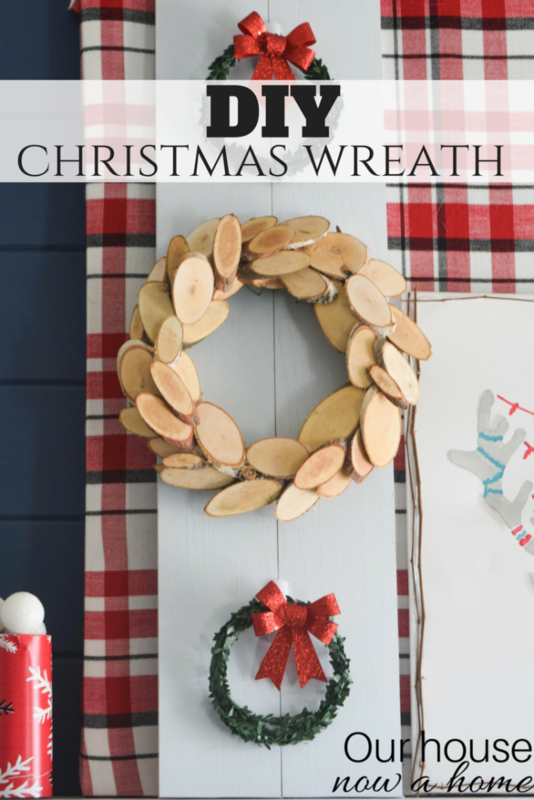 There is a lot of DIY Christmas ideas, so I am sharing a bunch of content with you all today. I felt it best to share the simple projects in a few collages and then break down a few key projects to make this overall look happen. If you have any questions go ahead and ask away. 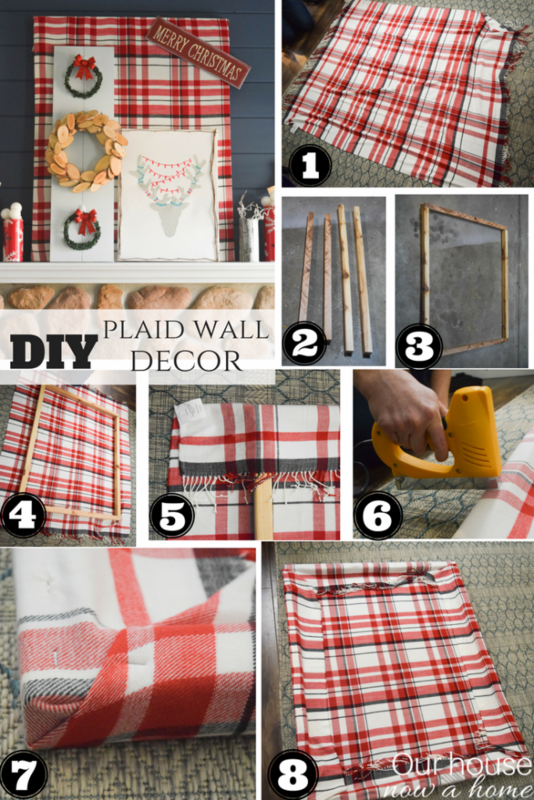 The first decor project I created was a plaid wall decor piece. This is being used as a backing, to layer in the other decorations. I loved the idea of using plaid, it feels so cozy and warm. It is also all over the place this season in stores! 1. Spread out the fabric or blanket. 2. 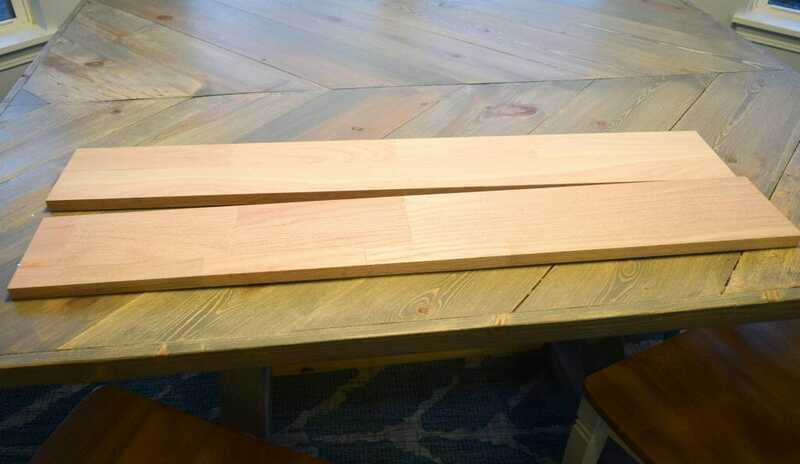 Measure what size you want this to be (in my case it is 3 ft x 2 ft) then cut thin boards down to size. 3. Nail the frame together. 4. Lay the frame over the spread out fabric. Get any creases or lines out of it. 5. Fold one edge down over the wood frame, keeping everything smooth. 6. 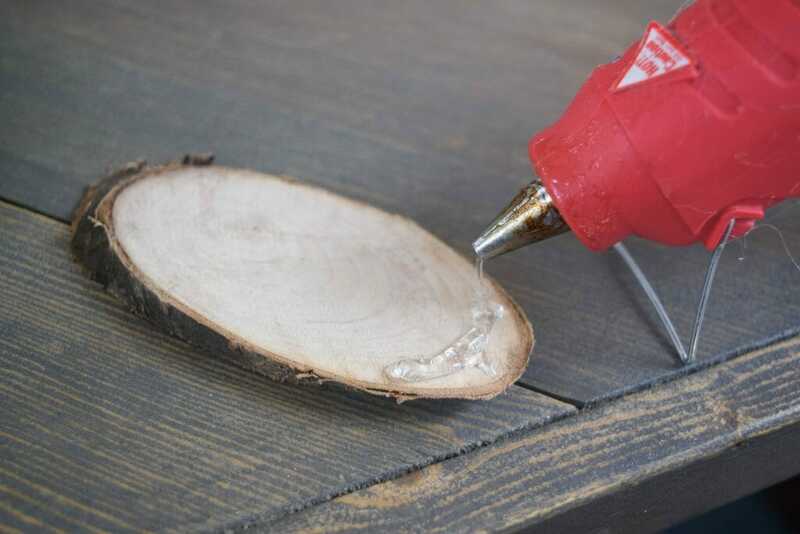 Staple along the edge, or use nails to secure the fabric to the frame. 7. For the corners, fold into itself then secure with more staples. 8. Done! 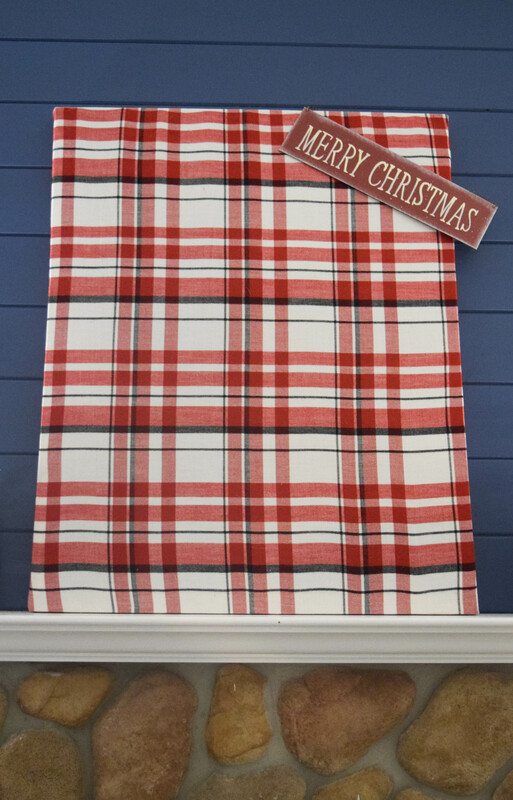 You can either cut off the extra fabric or leave it as-is if it does not show on the front of the wall decor. This is the first part to my big fireplace mantel decor mission. I used a Merry Christmas sign that I purchased a few years ago, it was the perfect Christmas cheer accent. I like the idea of using a bright and bold fabric for this, it is bright but a large portion of it will be covered up so it will not be too overwhelming. 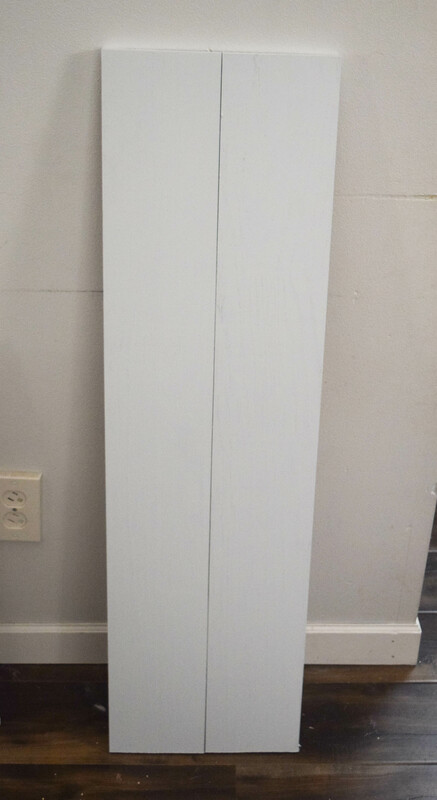 I plan to layer my fireplace with DIY decor, and this will be the back portion of the layered look. 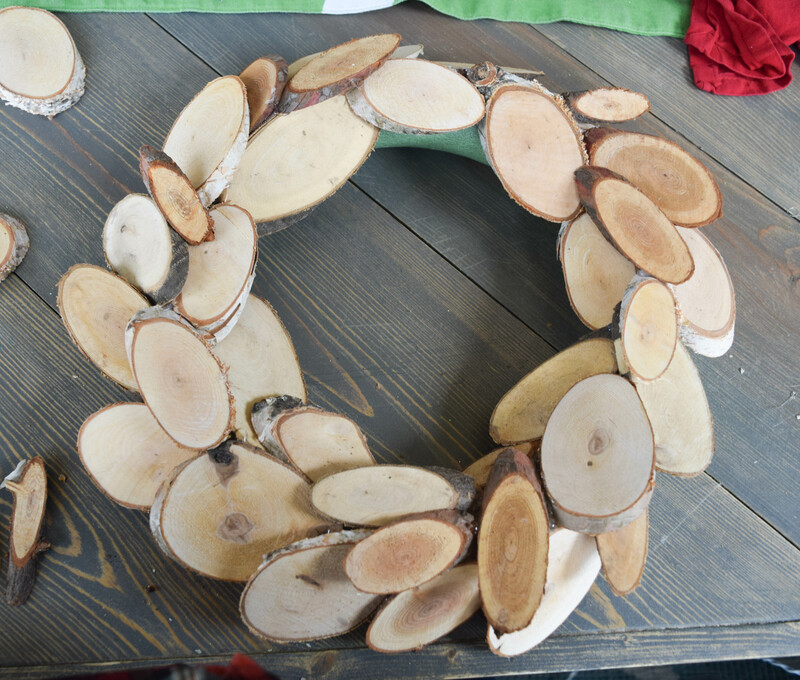 Next, I made a rustic DIY Christmas wreath! Well, technically I made three, one that is rustic and two that are dainty little wreaths. The steps to make these three beauties is really simple. 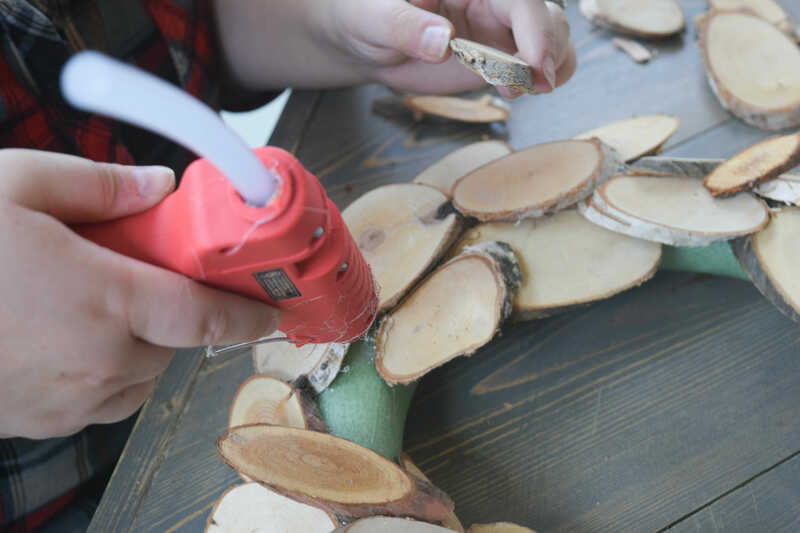 There is these bundles of birch bark that I instantly knew I wanted to use. 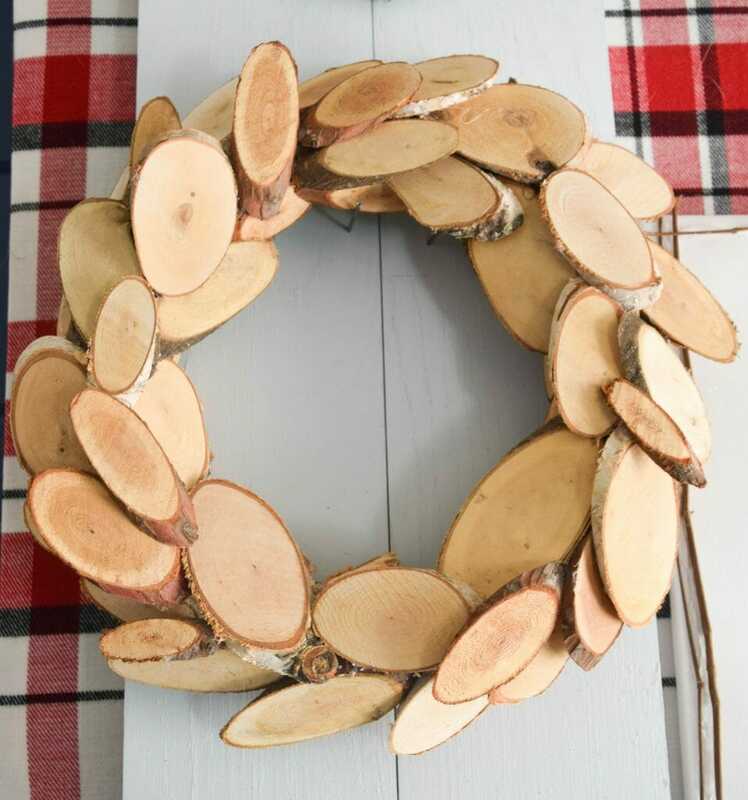 There is a ton of ready made wreaths at Joann’s which I loved so much, however I wanted to go rustic and simple for my wreath. 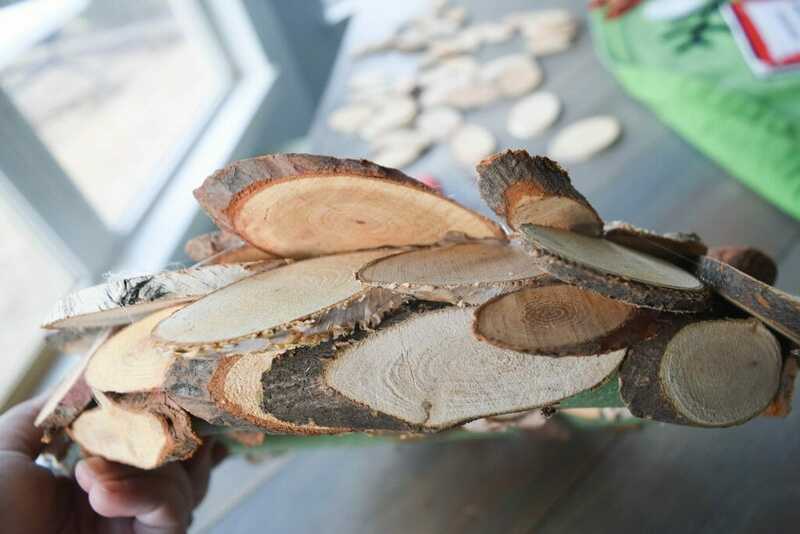 I thought that this tree bark pieces would be the perfect way to make my overall look happen. I had to layer in more than three in some spots in order to cover any holes. 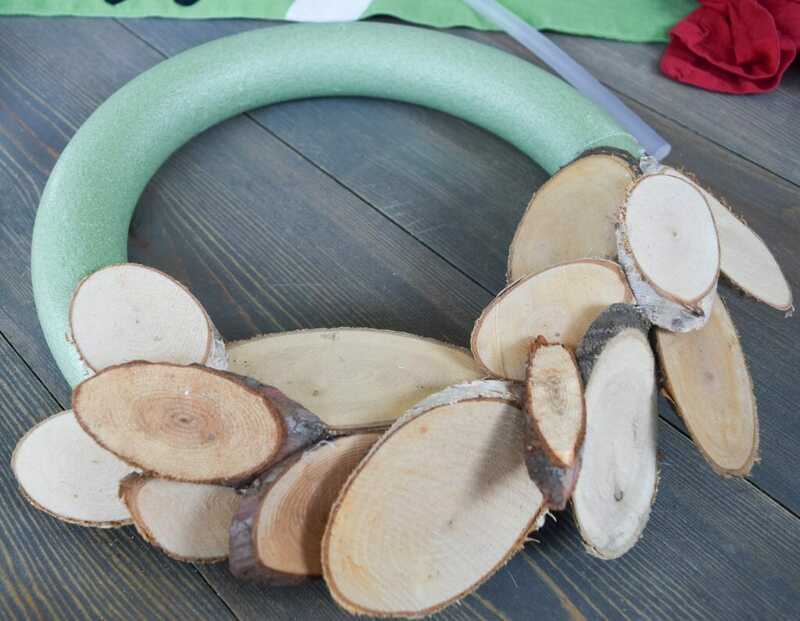 I think the best way to make this wreath a success is to play around with it. I would glue down a few pieces, then grab some more and place them in certain formations. Seeing if they would work together or if I needed to grab some other pieces before gluging them down. They came in varying sizes so I had a lot of options. I was pretty much done, but then I noticed that there was still places that the wreath frame was seen on the inside and on the outside. Since this is going on a wall I needed to cover all of the spots. Now, onto the other smaller wreaths. These were crazy simple to make! I used this cute green garland and these ready made bows. 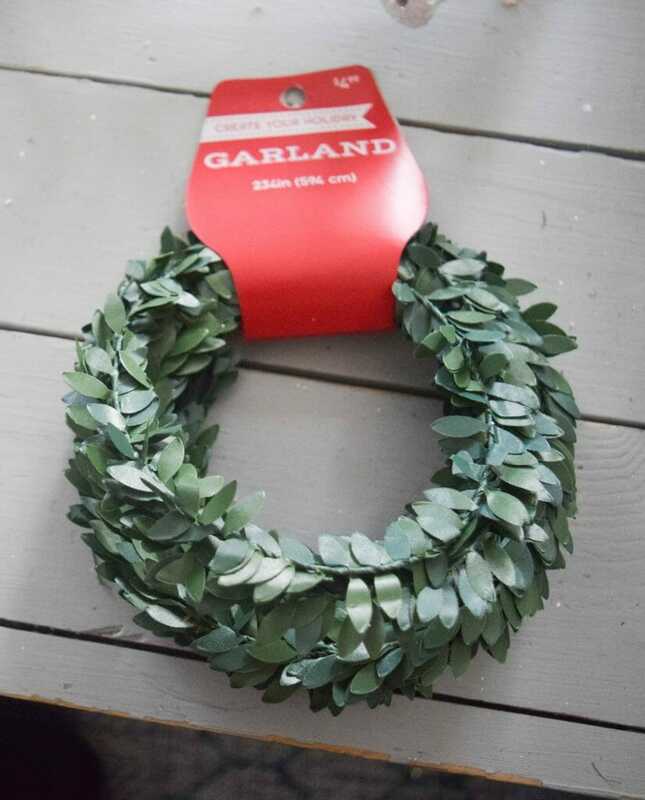 Cut off a portion of the garland and then decided the size I wanted for the wreath. 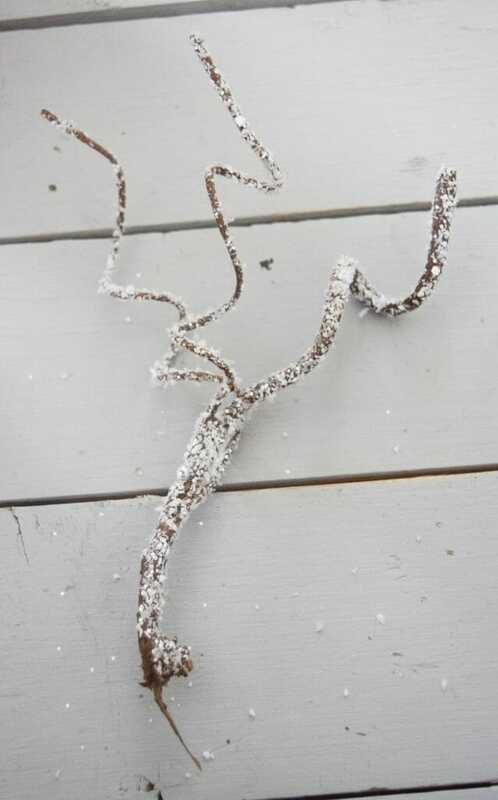 Then entwined the garland around itself keeping in mind the size I wanted. 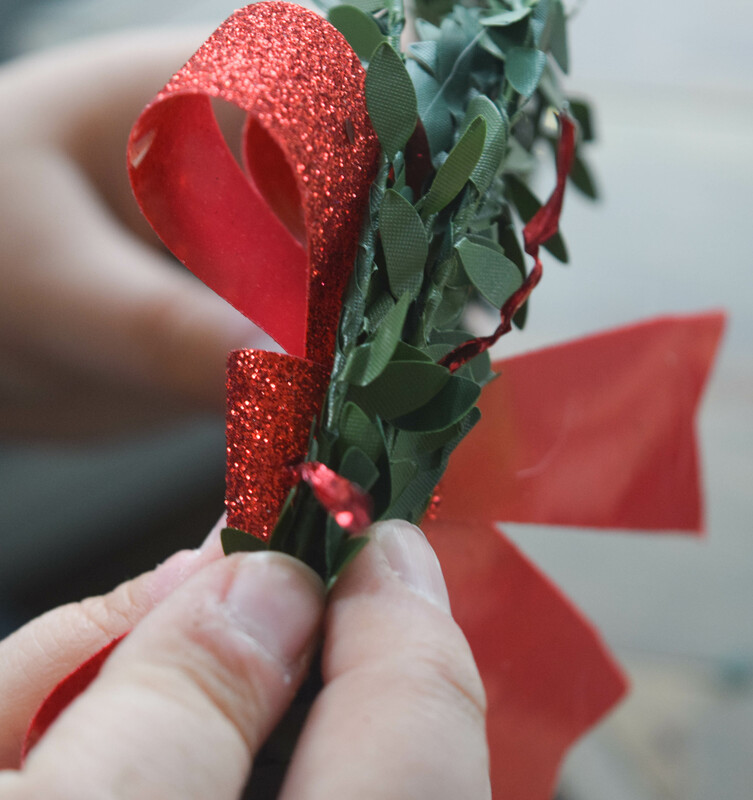 Keeping trend with this being crazy simple I then just used the twisty tie of the bow and tied it onto the garland wreath. 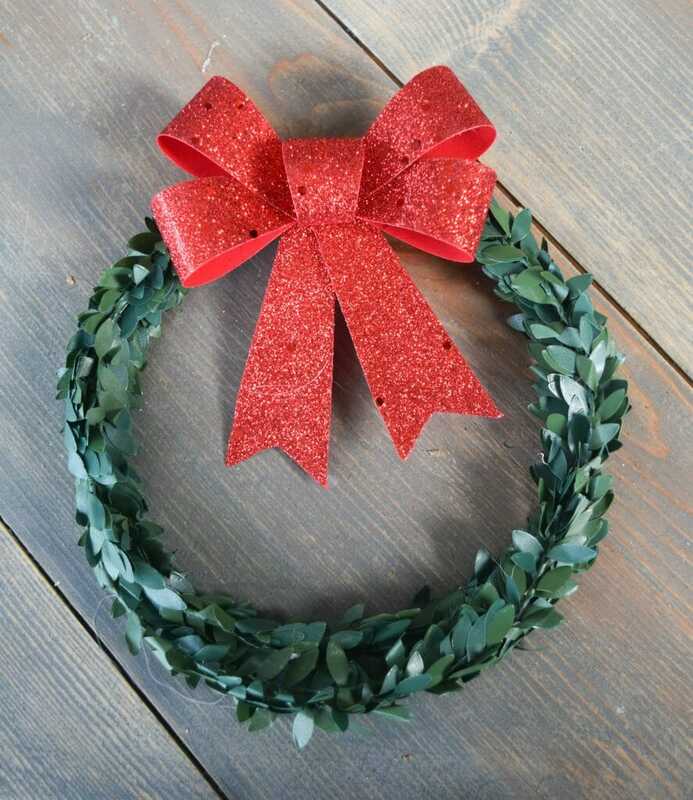 I made two of these cute and dainty Christmas wreaths. 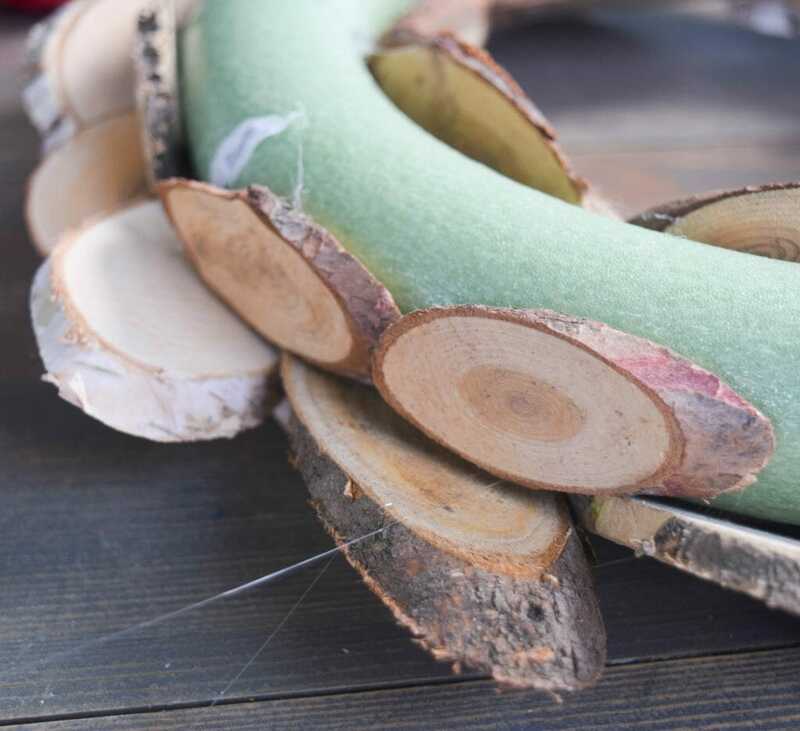 To make these three wreaths come together I used two wooden boards. My living room has a vaulted ceiling, so I have to go big and over sized with my fireplace mantel decor. Otherwise all of the decor feels too small for the room. 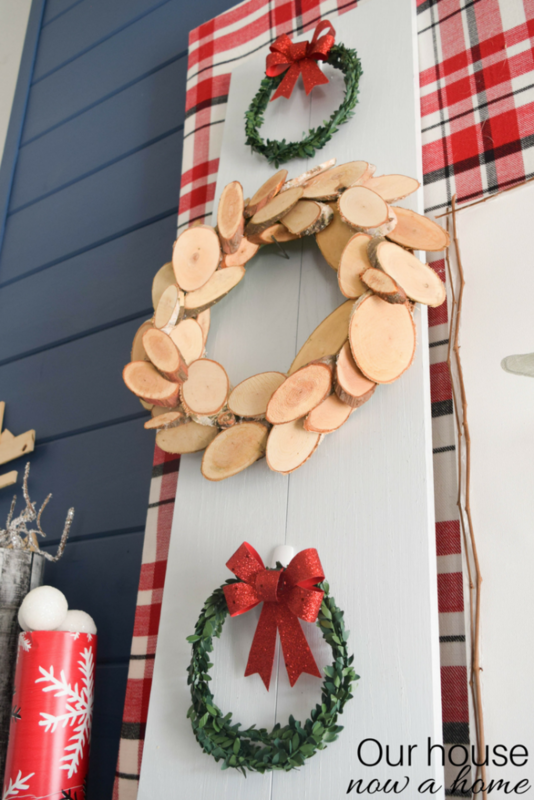 I like to go for height with the decor and these two boards will help me utilize the large space to show off these Christmas wreaths. 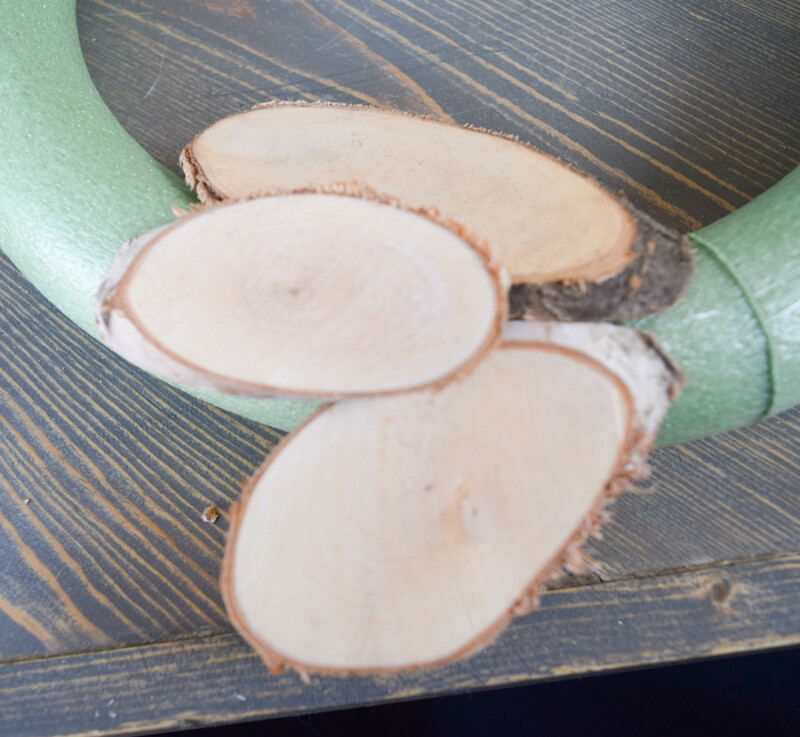 Measure and cut the wood once the wreaths are set on this, making sure the space in between them is even. 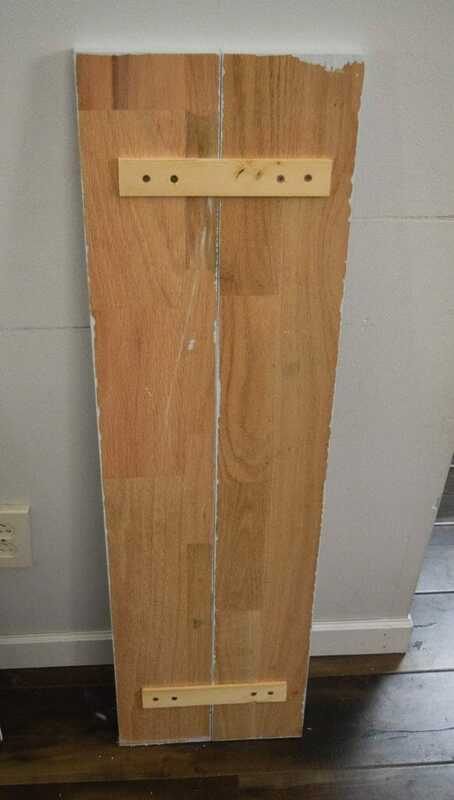 Attach the boards with scrap wood and nails. I chose to paint this white. 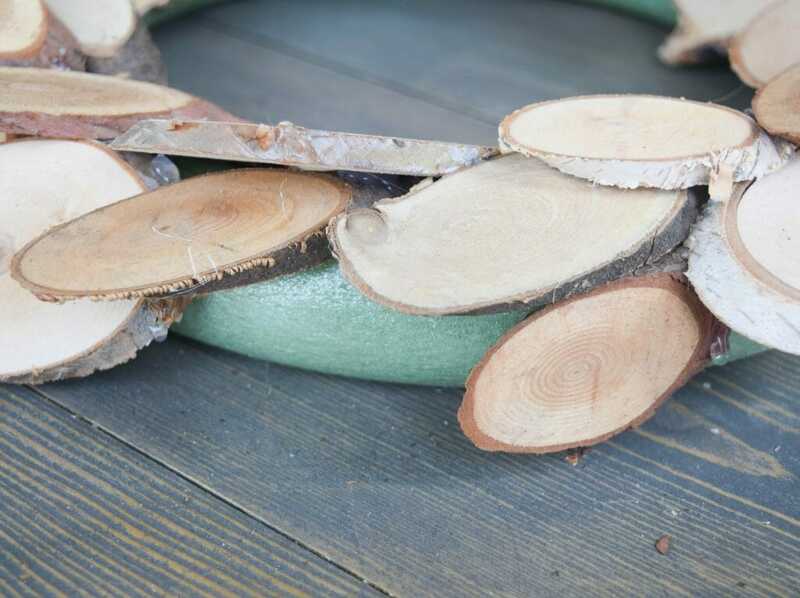 I wanted to keep this simple, these wood boards are not the main event for my fireplace, it is the wreaths that I want to show off. I am also going with a red, white and wood theme for this so the white boards work perfectly. Command strips for the smaller wreaths worked amazingly well! 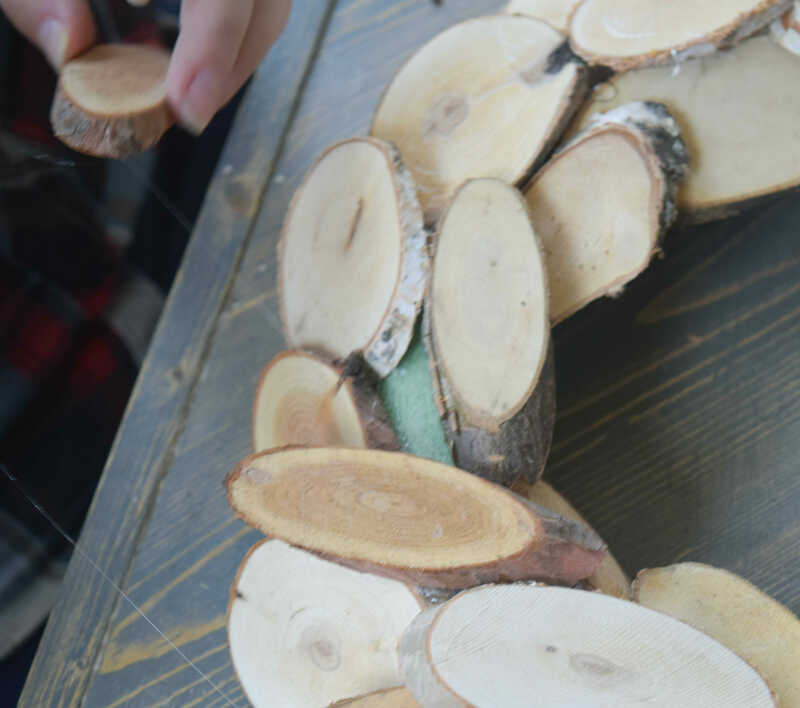 The rustic wood wreath was attached to the board with two nails and then setting the wreath onto the nails. I could have glued or attached all of these wreaths onto the boards but, I wanted to keep my options open for other seasons. 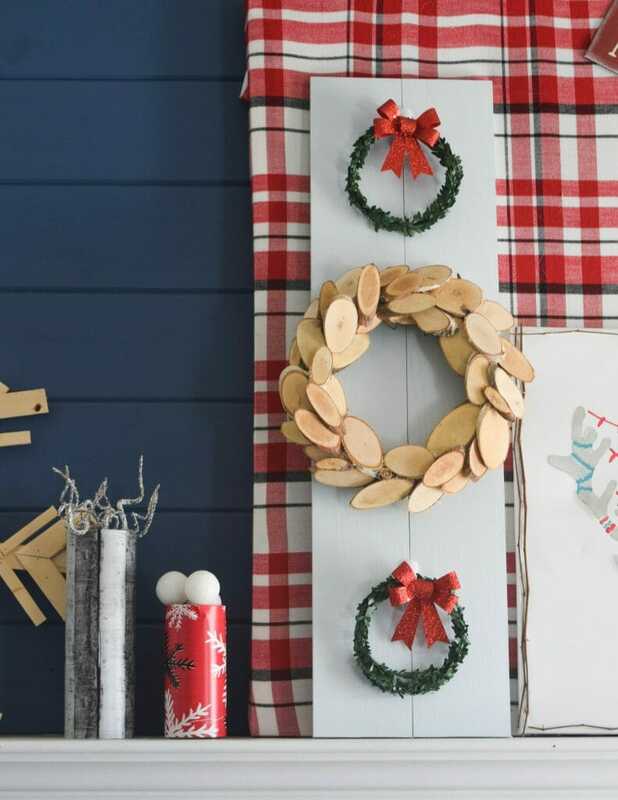 Maybe use these boards for something else, or even the wooden wreath for another season. It can be pretty versatile because I kept is simple. This is the next addition to my quest for new fireplace mantel decor for this holiday season. I knew I wanted to add a touch of whimsical for this fireplace mantel. 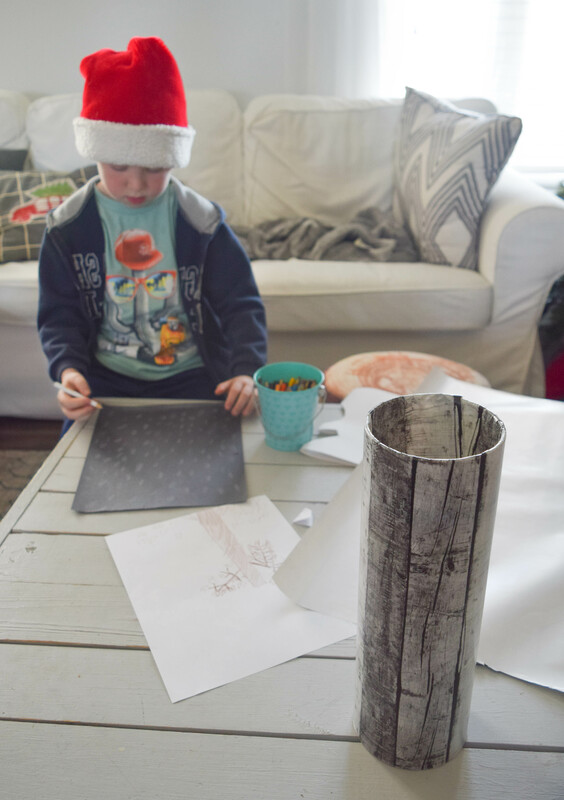 I have little kids and the magic of the holiday season is what makes it so special. 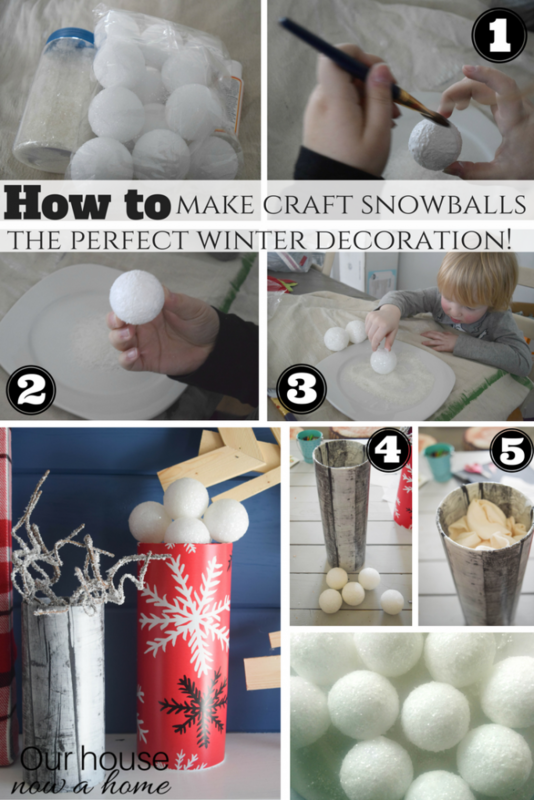 I created some craft snowballs to add that touch of whimsy I was looking for. They are really easy to make, and my youngest son Gavin wanted to help me out. It is a great kids craft idea! 1. 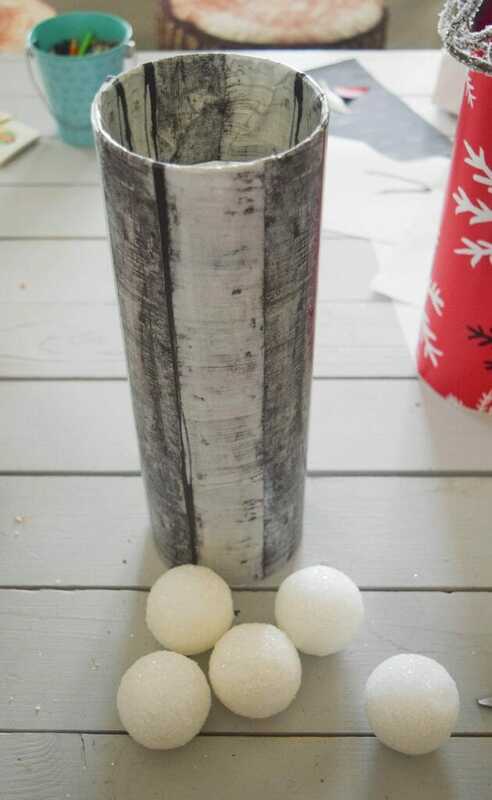 Using Styrofoam balls and paint glue all over it. 3. I am getting a little ahead of myself and will share the vase idea soon. I sprayed the snowball with hairspray to keep the glitter on it. 5. 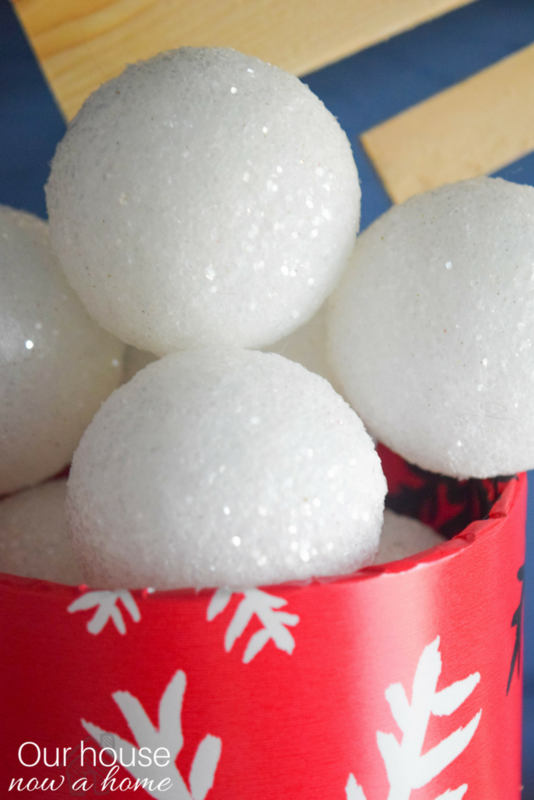 Stuff a towl into the container and then layer in the craft snowballs. I ended up with a pile of snowballs that look ready to be the perfect accessory for a winter snowball fight! 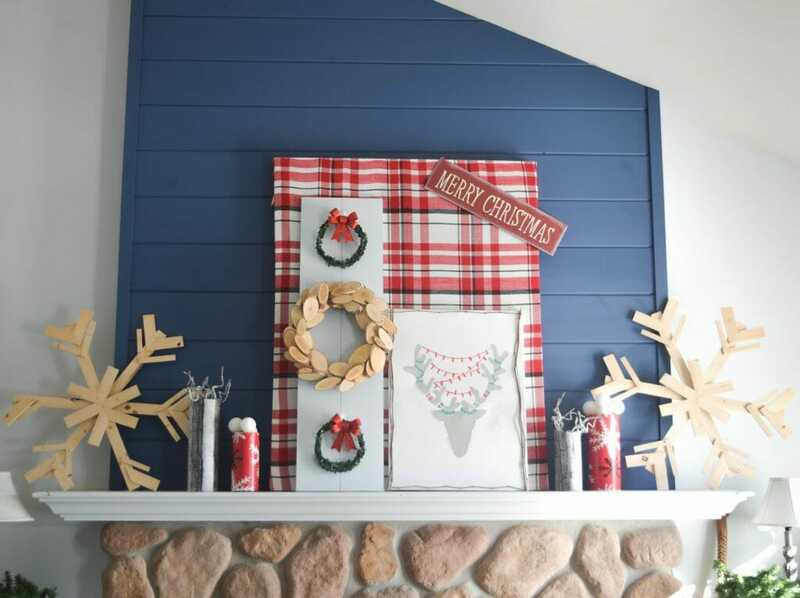 The next part to this Holiday handmade – decorating a fireplace mantel with Christmas DIY ideas is to fill up the rest of the fireplace mantel with even more color. 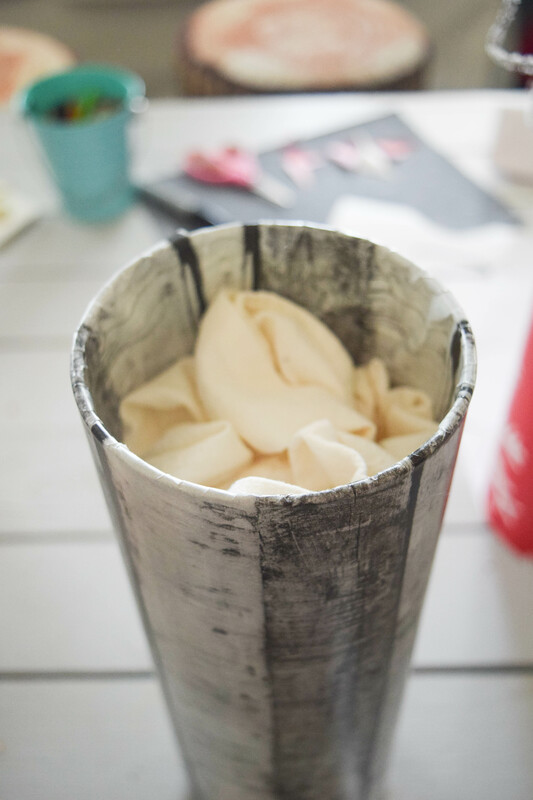 Also making containers for those fun craft snowballs. Wrapping paper can be used for so much more than just to wrap presents! 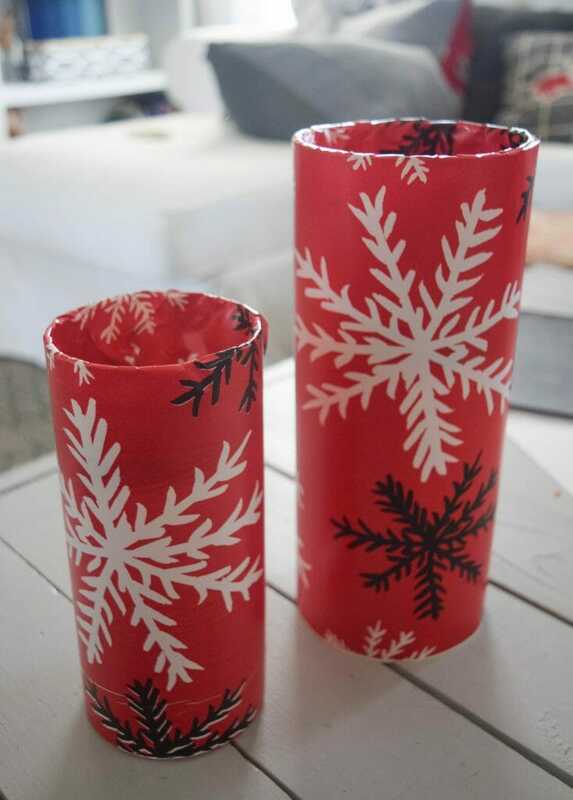 I purchased these glass vases and then two different wrapping paper, one that is holiday themed in color and style; then one that goes along with my rustic theme. 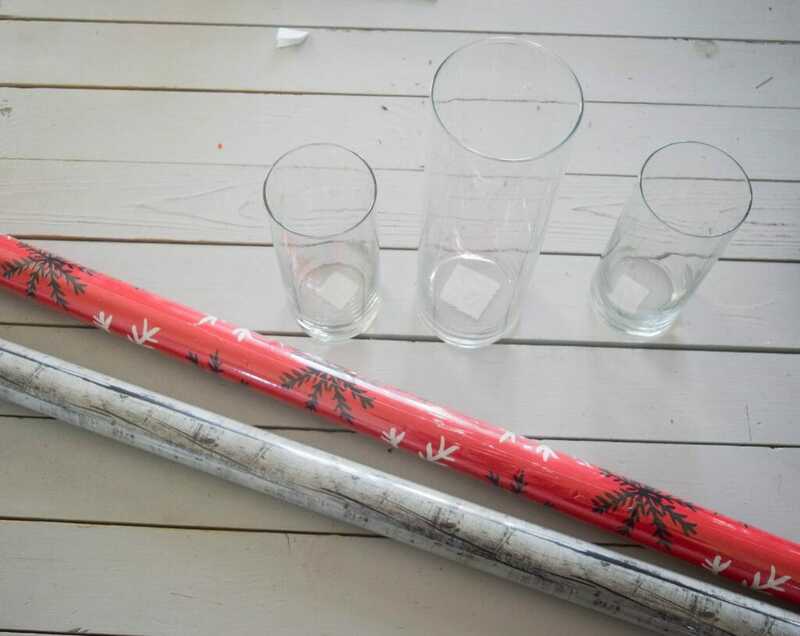 Lay out the wrapping paper and see where the glass vase goes to on the paper. Cut the paper about 4 inches over where the glass vase rests on the paper. 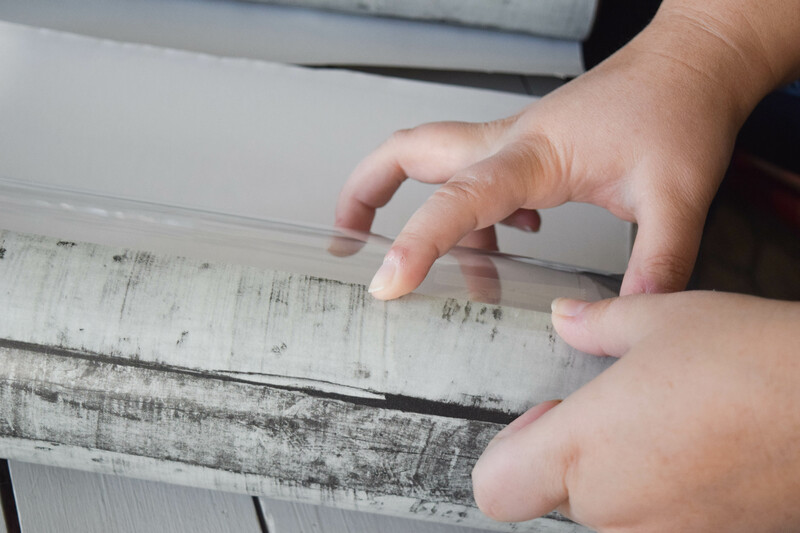 Make sure you can warp the paper completely around the glass before cutting it. Roll the paper around the vase. 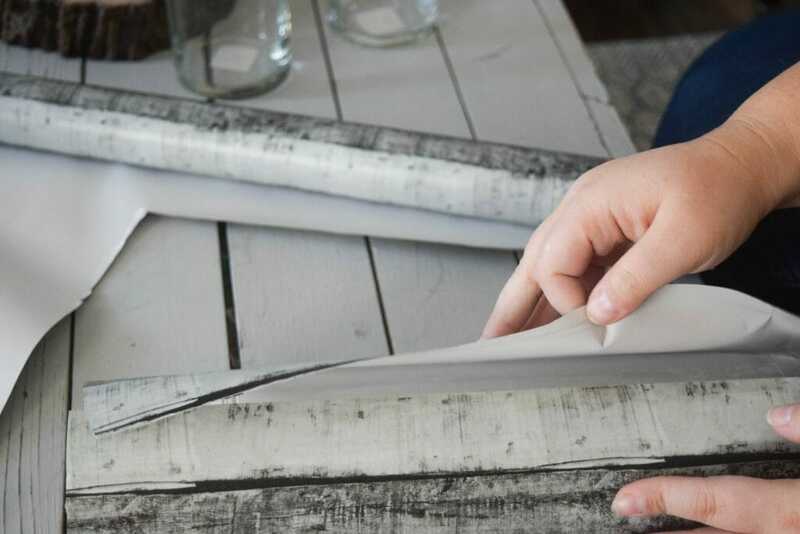 Secure the wrapping paper with tape. I like to use tape so that I can use these glass vases again. I change my decor too much to commit to always using these glass hurricanes for just my holiday season, I need options. 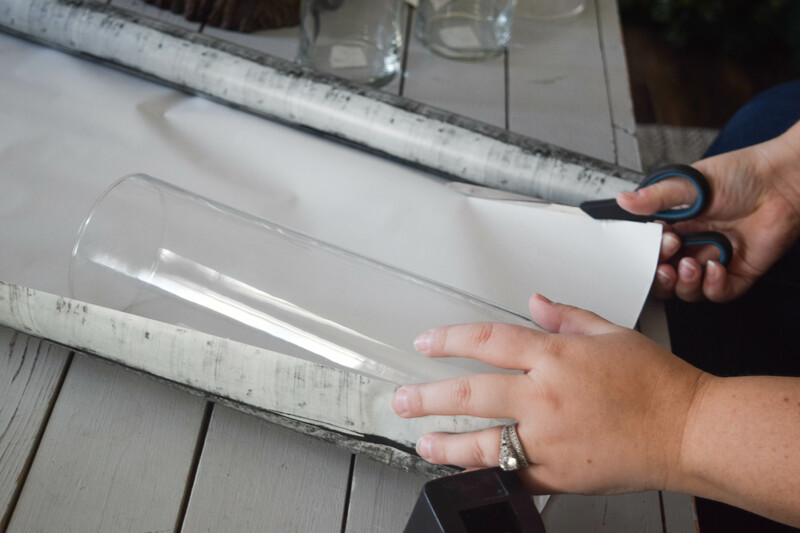 The clear tape will not be seen, but it will keep the paper attached to the vase until I am ready to unwrap it. 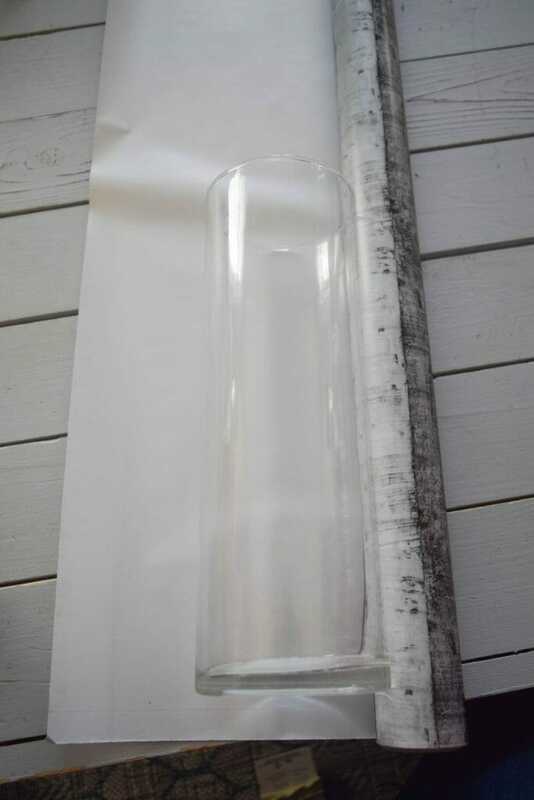 I taped the paper crease as well as on the bottom of the glass vase. To secure the top and not have the seam showing of the paper I simply tucked the top of the paper inside of the vase. 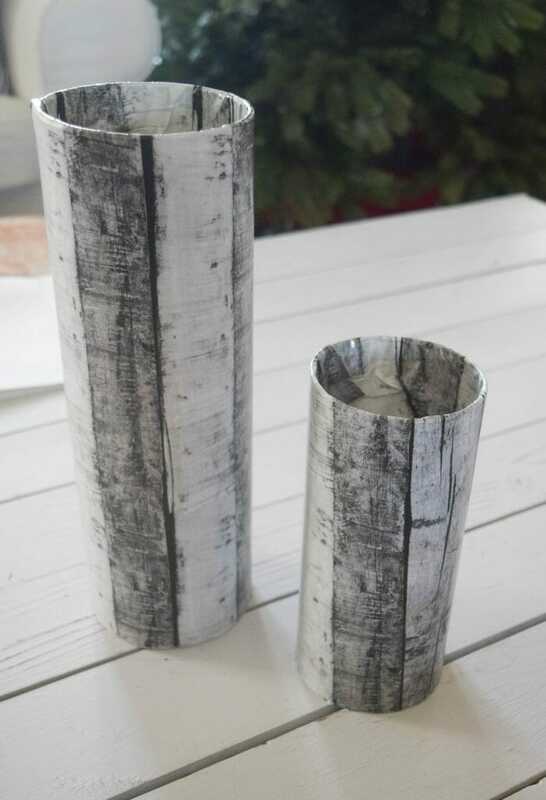 I covered two vases with each of the paper. My little helper was inspired to get to creating as well. The Santa hat helps I am sure. Here is where those whimsical snowballs come in. 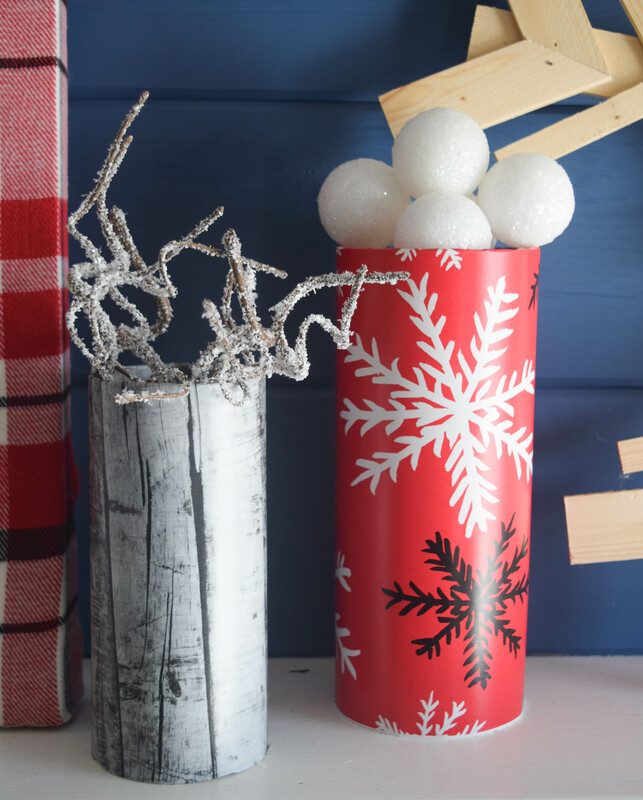 Put a towel into the base of the vase and then set the snowballs on top of it. This gives the illusion of having the container filled with snowballs without having to actually make all of them to fill it. No one has time for that! 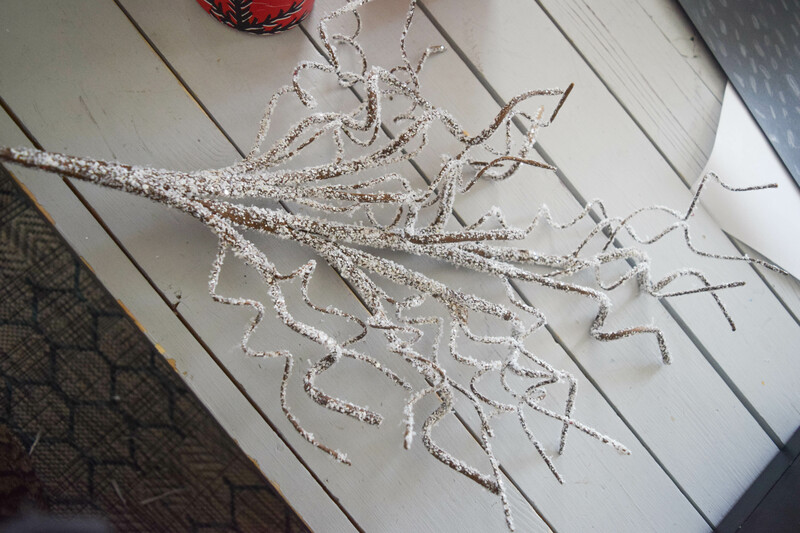 The plan was to have two vases with craft snowballs and then two with some kind of greenery but when I was at the store I loved these snow covered branches. They were bulky and a little too big for what I needed. 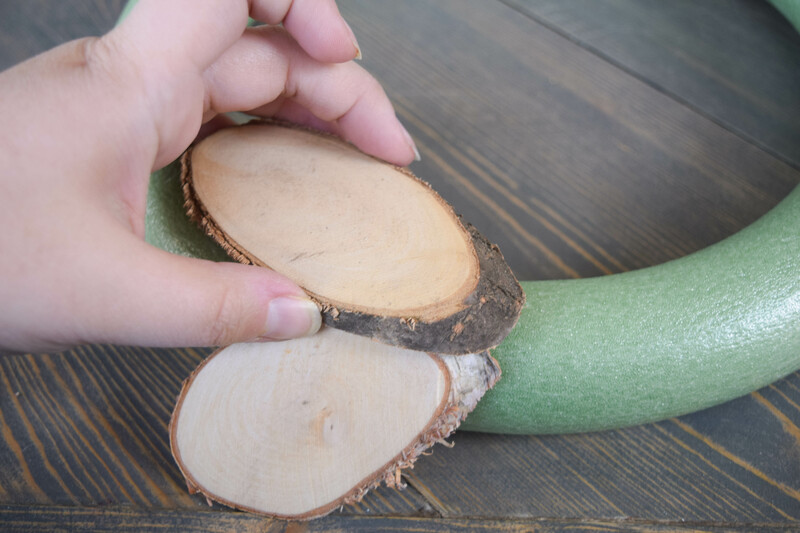 So I cut the branches down and then was able to set them into the glass vase. It is beginning to look a lot like Christmas!!! Ah you guys, I am almost done! I should mention that I made the large wooden snowflakes a few years ago, you can find that tutorial here. 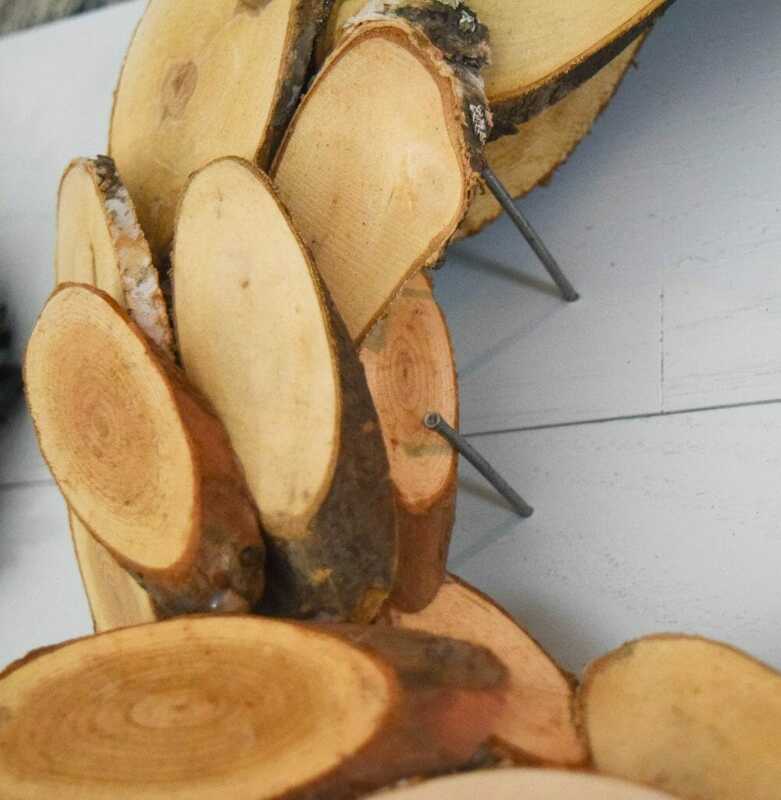 They were very straight forward to make, and I used scrap wood for them. Crazy low cost project! The reindeer canvas art was also made already. I thought that the colors in it would fit perfectly with all that I had going on. That tutorial can be found here. The final stretch! 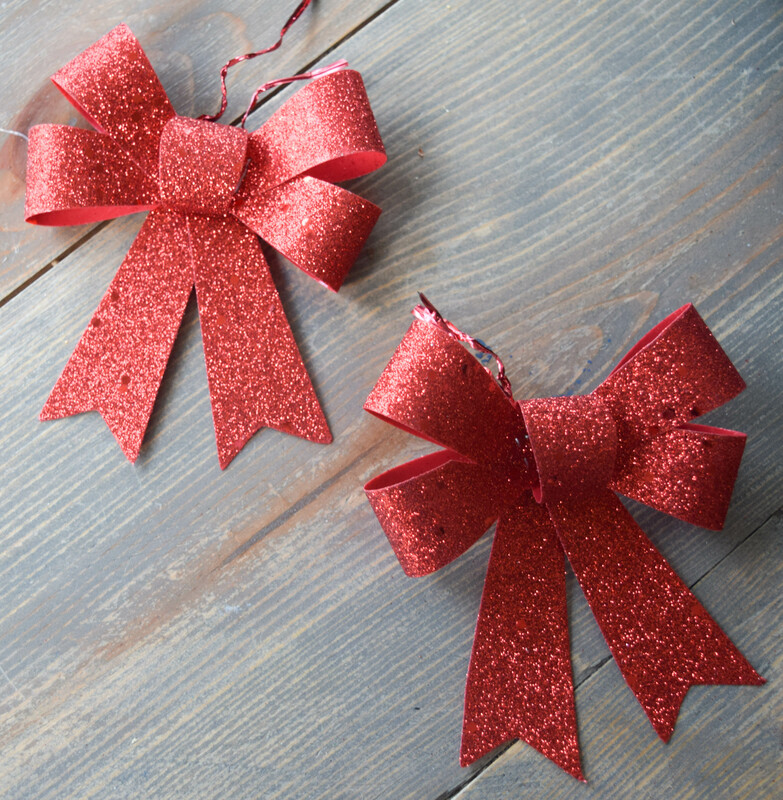 My last Holiday DIY idea! 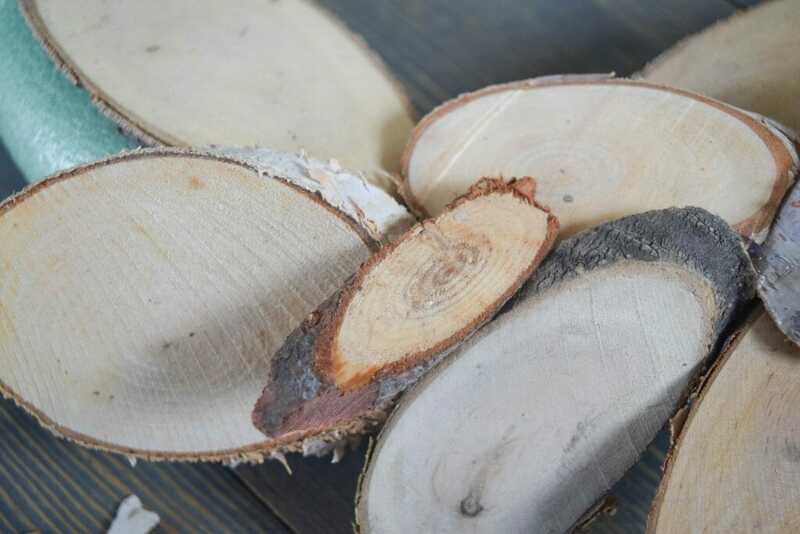 I wanted to make something that our firewood could be stored in without loosing the style and the decorated look to my fireplace. I mean, I am all about function but like to decorate. Combining the two is key! 1. I loved this basket, but the color did not quite go with my desired aesthetic for the fireplace. 2. I spray painted it white, keeping with my snow and winter theme. 3. This gray plaid blanket called to me, I did not cut this at all so a good washing and it can be used as a blanket again. 4. Set the blanket into the basket. 5. Using a piece of cardboard, cutting it down so that none of the cardboard goes above the basket edge. 6. 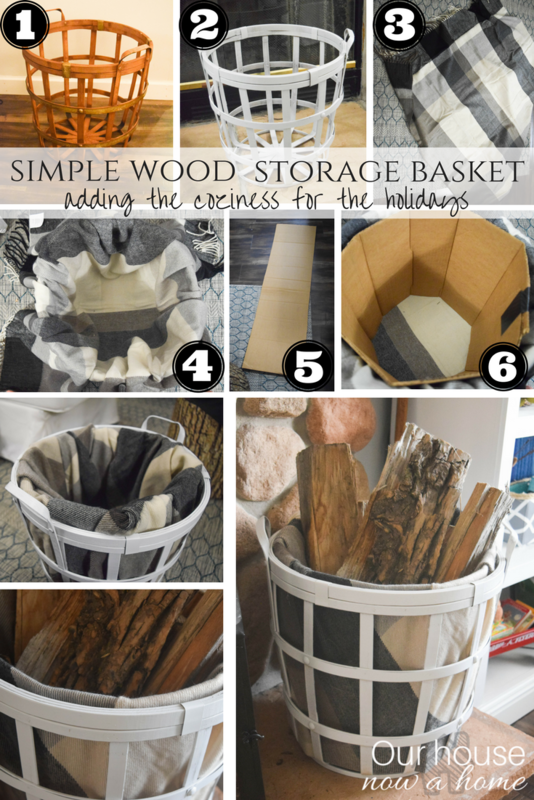 Wrap the cardboard around the inside of the basket. Using tape to secure it to itself and keep it in place. The rest of the steps is just to tuck the blanket back into the basket, covering up the cardboard altogether. I thought that cardboard would be a good buffer to set the firewood into the basket without it popping out of the basket or tearing the blanket. Once the blanket was secured into the basket I did a lot of finagling of the fabric to smooth it out, tucking some of it towards the back of the basket where it will not be seen. 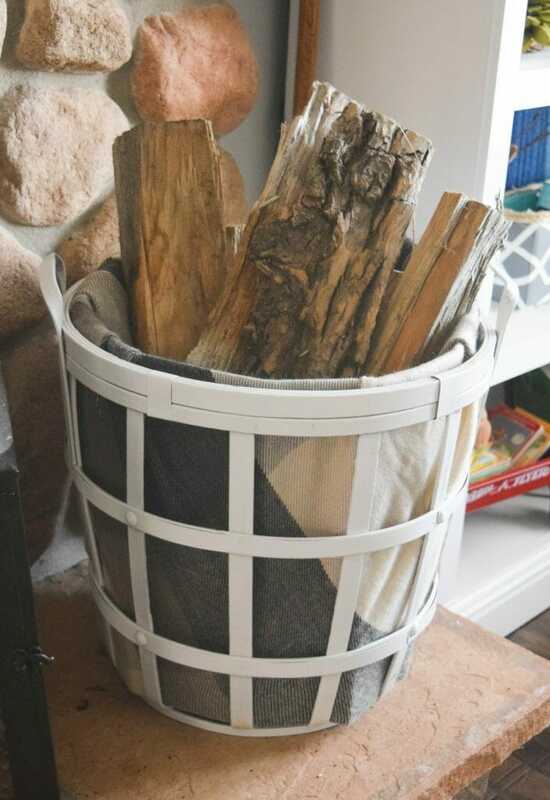 I loved the warm feel to this, and that much needed function for firewood storage is nice too. With this last addition my Christmas fireplace is done! Guys, I am loving the bold and bright colors of this! 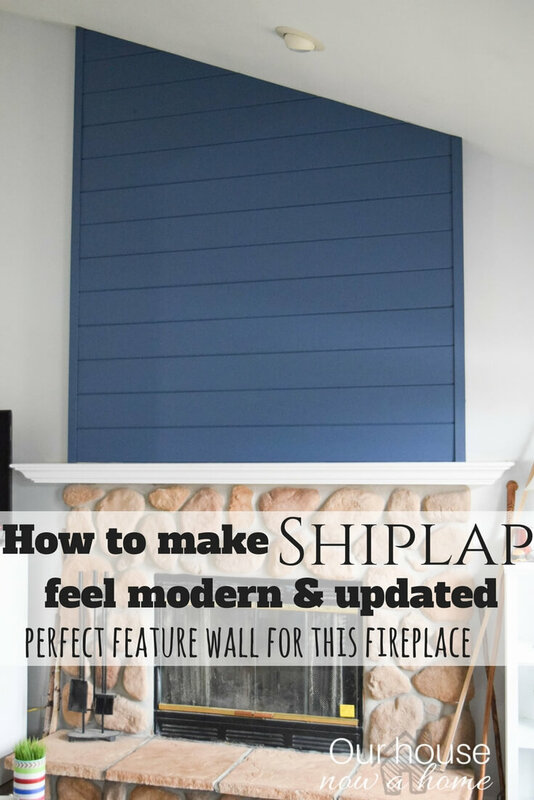 I worried how I would make my navy blue shiplap work. I could have gone with a very neutral color scheme for this, but that is just not me or my family. We are bold, loud, fun and full of Christmas cheer this time of year. I have years to have a formal, fancy and more mature fireplace mantel. For now, at this stage of my family we are young and full of Christmas magic, I like my home to reflect that magic. Full disclosure, this was my first wreath I have ever made. 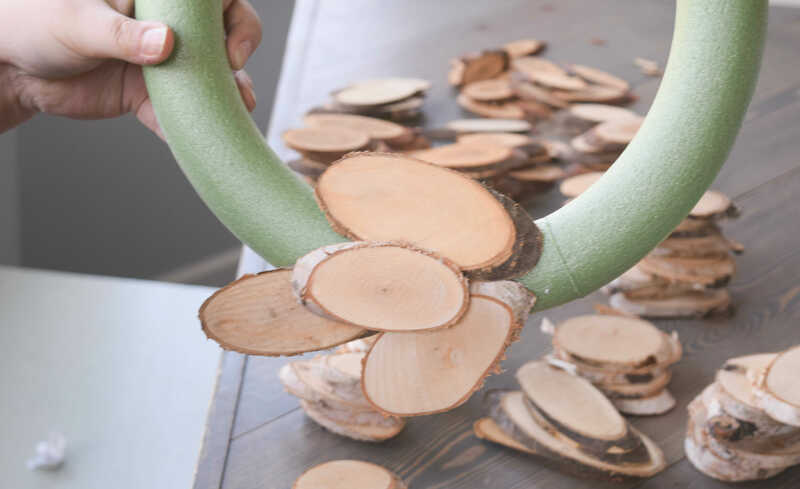 No clue how I have gotten away with being a DIY home decor blogger and not making a wreath, but I am hooked! Growing up in San Diego, California I used to hope that it would snow, I wanted a white Christmas so much… spoiler alert… it never happened. I did however go to the beach on Christmas day though, so there is that. However, now that I live in Wisconsin we get snow, A LOT of snow. I have to say, I love every minute of the slushy and cold stuff. It feels like a traditional Christmas with snow falling outside. Having it inside the home in small ways adds even more magic to the season. I may be finding glitter in my home for months, but it is worth it! Sneak peek to my living room all decorated with it’s Christmas trappings. 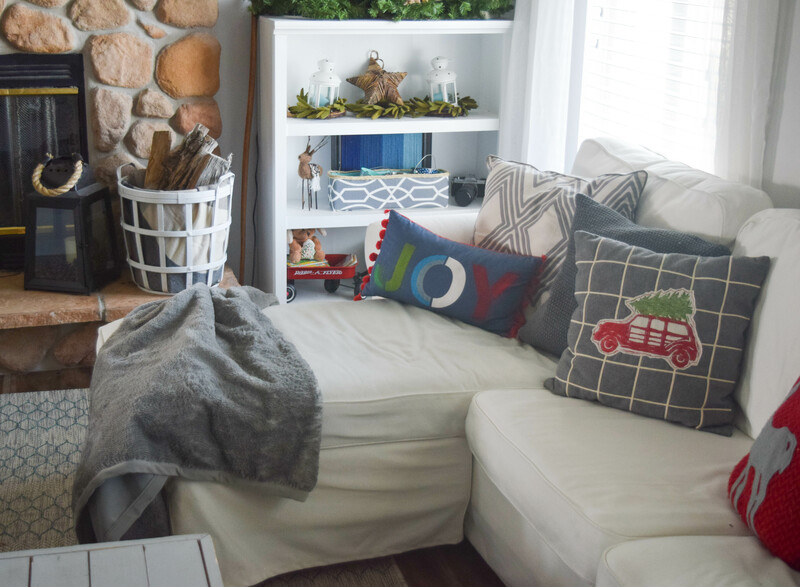 We have not hung our stockings yet, but those will be the last addition to this space, I am so excited to share how my home looks for the holidays after I swapped up the furniture and changed around a few rooms. 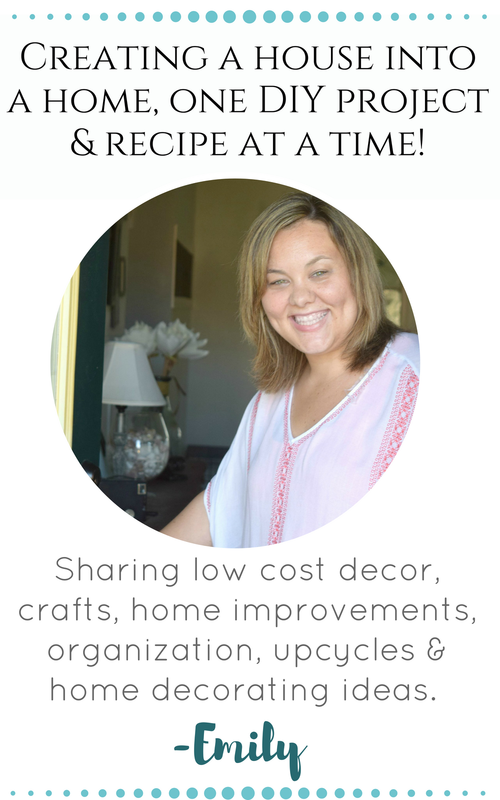 You can get reacquainted with new layout here before you see the complete home tour on Monday. 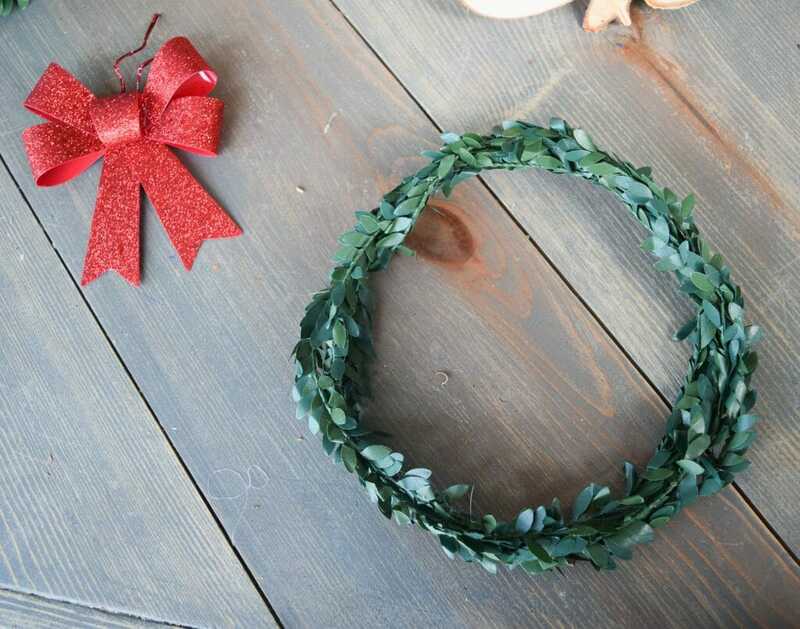 Dainty little Christmas wreaths like this really allow just a touch of festive without it being too much. I think the mix of the rustic wood is needed to tone down all of the bold colors. Don’t get me wrong, bold is always good in terms of decor. However, with the added decorations to my home for the holidays it can feel a little cramped. Toning things down with white, or some neutral colors can help balance it all. 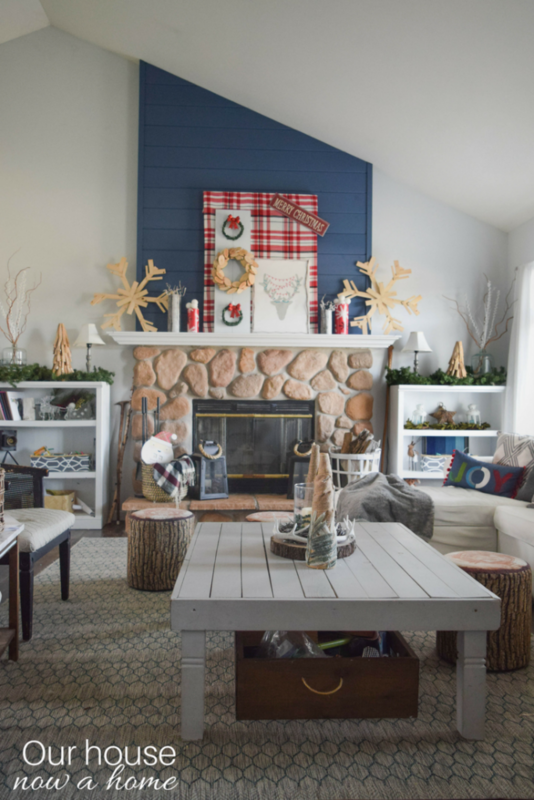 Using wood adds a warmth with the texture that brings the coziness, which feels right at home for this time of year. I am soooo ready for having a fire in the fireplace, drinking some hot chocolate and listening to Christmas music. Yep, pretty much what I hope to do a whole lot of! Thanksgiving is over, that means I am rocking Christmas music from now on until the New Year, just how it works in my home. The fact that all of the decor on my fireplace mantel was done DIY style is great to me. I like that it is things I made, put time and energy into. It also allows me to customize all of it to fit perfect with my home in terms of size and colors. 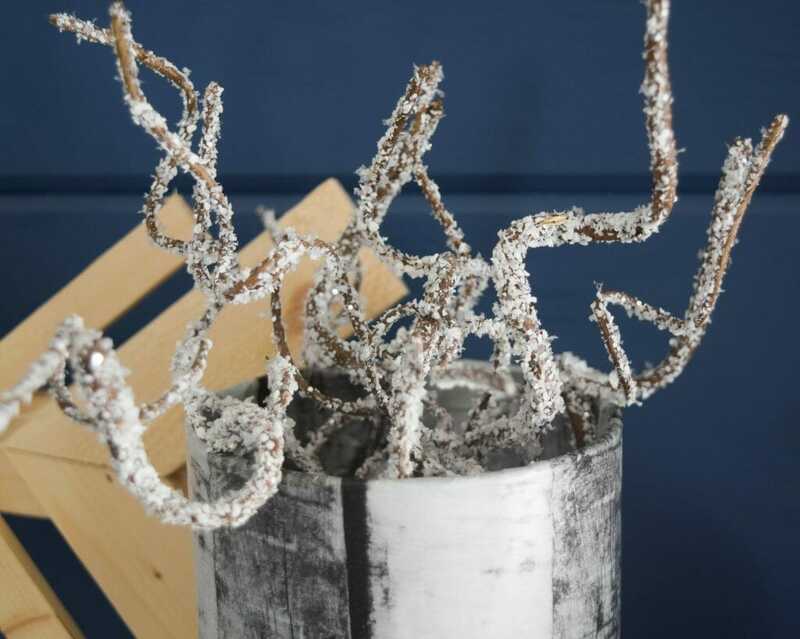 So yes, decorating an entire space in your home with Christmas DIY ideas is definitely possible. My crazy crafting binge really helped bring my living room together for the holidays. The colors in the decorations feel fresh and new. I am all for having a traditional feel for the holidays, but modernizing it a little is nice. Whew, I did it! I made my fireplace mantel ready for all of the Christmas cheer my family can squeeze into it. When I put up the navy blue shiplap I did worry about how I would make the color work for the holidays, but I figured that would be a problem for future me to figure out. Well, future me got to work creating what I needed to blend the navy blue into my Christmas decor. 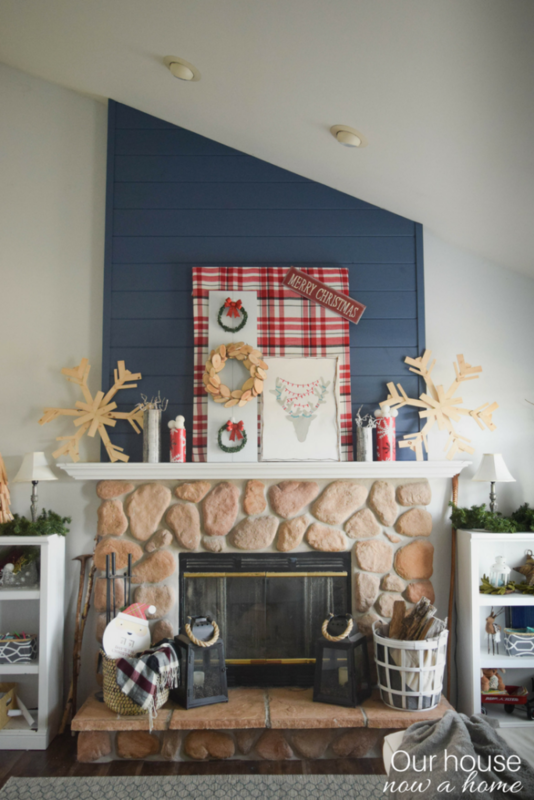 Holiday handmade – decorating a fireplace mantel with Christmas DIY ideas packed my living room with Christmas cheer, pops of color, warm patterns and rustic texture. I like to make my home feel authentic to us year-round. Making the holiday specific decor blend into my current decor instead of awkwardly sitting around it. 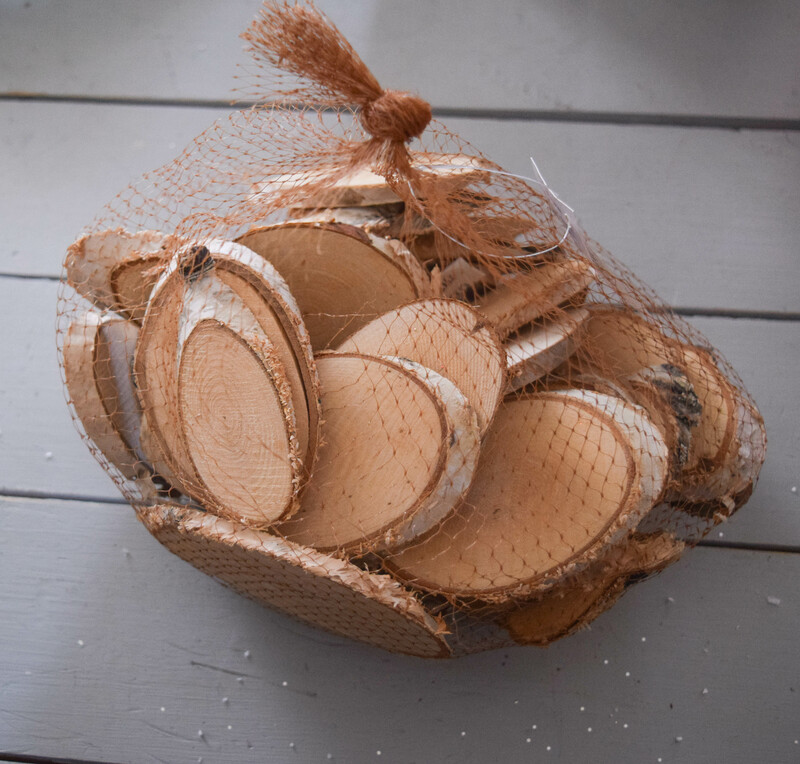 Since I like to go with a smidge of traditional; decorating with shells everywhere this time of year will not work. Thinking outside of the box, perusing craft stores, turning on some holiday music and getting my craft on was my sweet spot to make my fireplace mantel work for this wonderful season. Bring on the hot chocolate and all that the season has to bring, I am ready for it! I LOVE your stone fireplace…so cozy. 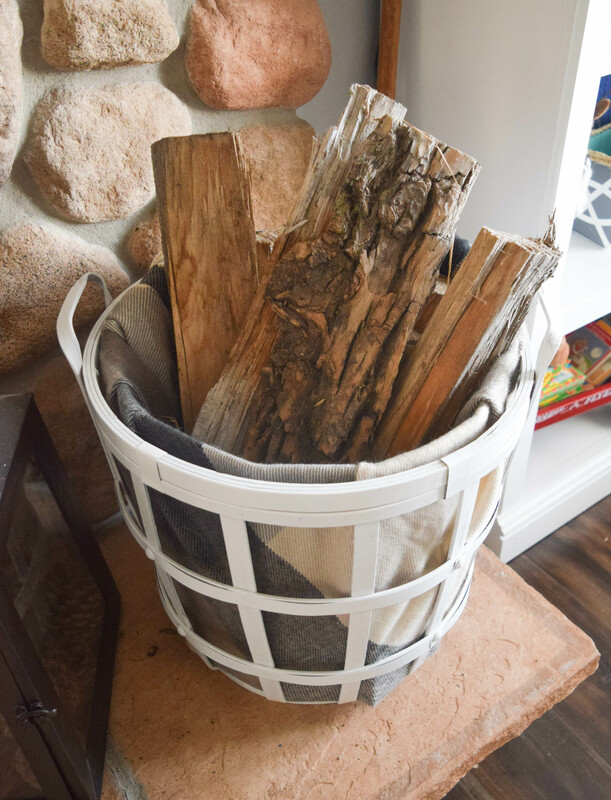 I think my favorite things is the wooden basket to hold firewood…such a cottage feel. Thank you, it is really nice to have the basket for the firewood! Thank you! This was my first wreath and I think it went pretty good. The wood seems to be holding up well so far. When I see things like this, it makes me long for a fireplace and a mantle even more. I love all the details and step by step photos that you’ve included on how to get this look. Thank you! I am so happy you found all of these steps helpful. OK how talented are you! Your display looks absolutely beautiful just perfect for the Christmas season. Thank you so much, you are so sweet to say that! Homemade decorations really make Christmas feel cozy. I try to find new ideas every year and your ideas are adorable. 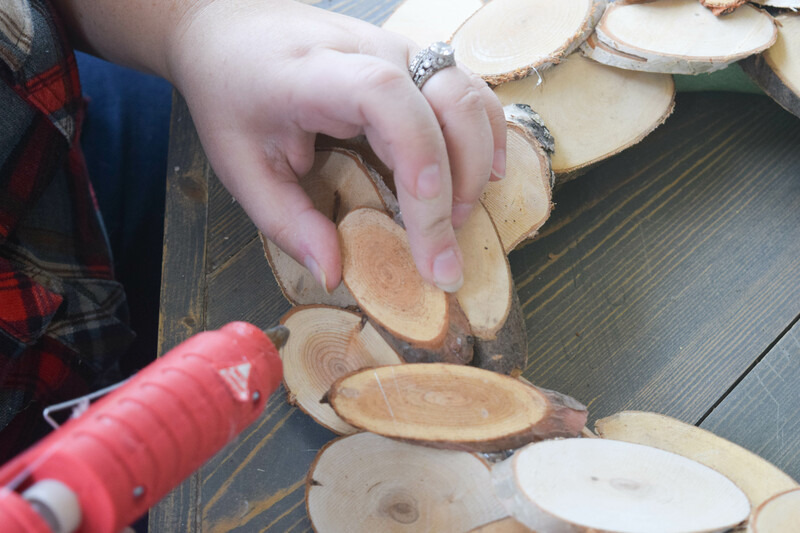 I can’t wait to try my hand on a wood wreath. Thank you! Good luck with your wood wreath! This is such great timing. 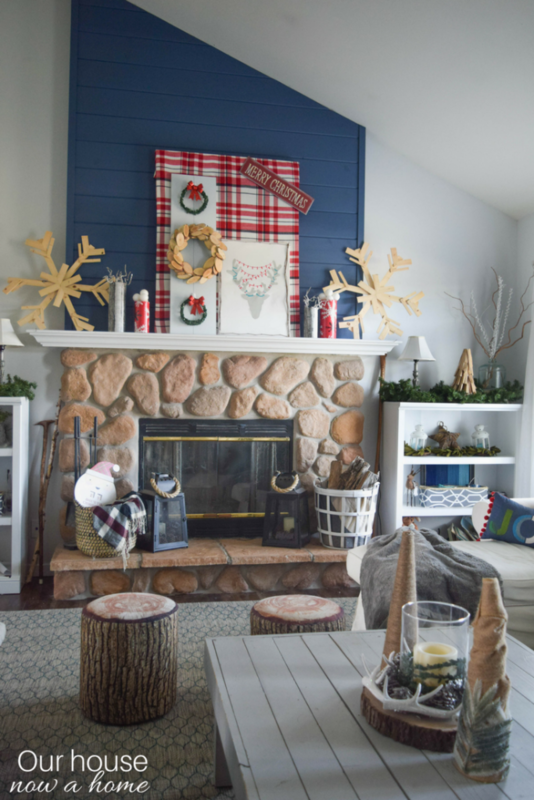 We’re decorating the mantel in our new home for the first time this year and I need all the inspiration I can get! Thank you! How exciting to be in a new home! I am so happy that this came at the right time, happy decorating! 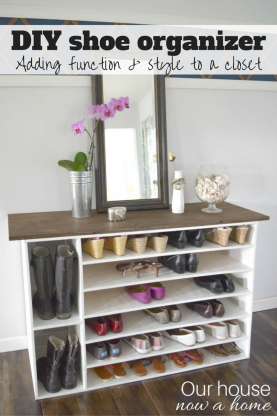 Your style is gorgeous and your DIY ability is amazing. I LOVE your mantel. The colors and the cozy feel make it perfect for the rest of your room. What an awesome project. 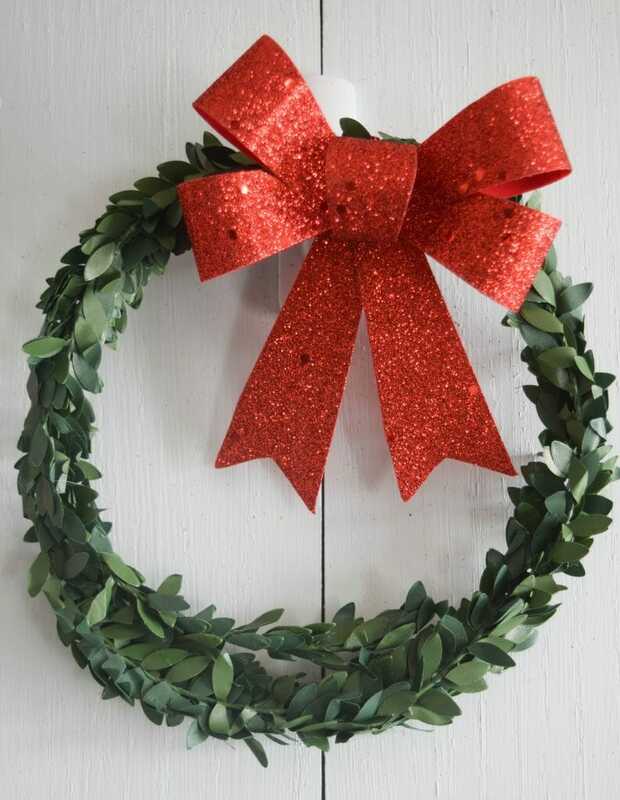 Your fireplace looks super nice and like the wreath you made a lot! Your fireplace mantel turned out really nice. The plaid fabric/blanket was perfect. I wouldn’t have thought about using it. We don’t have a fireplace mantel but I do have a breakfast mantel. I need to add some style to it. Thank you! I had a lot of fun decorating my fireplace! Oh, my this is so cute. I love the simple festive look. I wish I was more DIY talented but I am not. I do however love to see crafts that others do and even sometimes try to recreate. 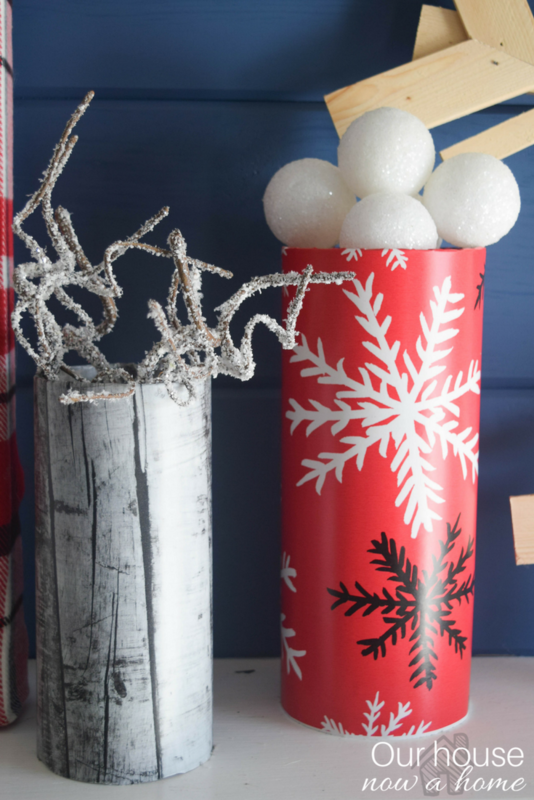 These DIY decorations were really easy to make! 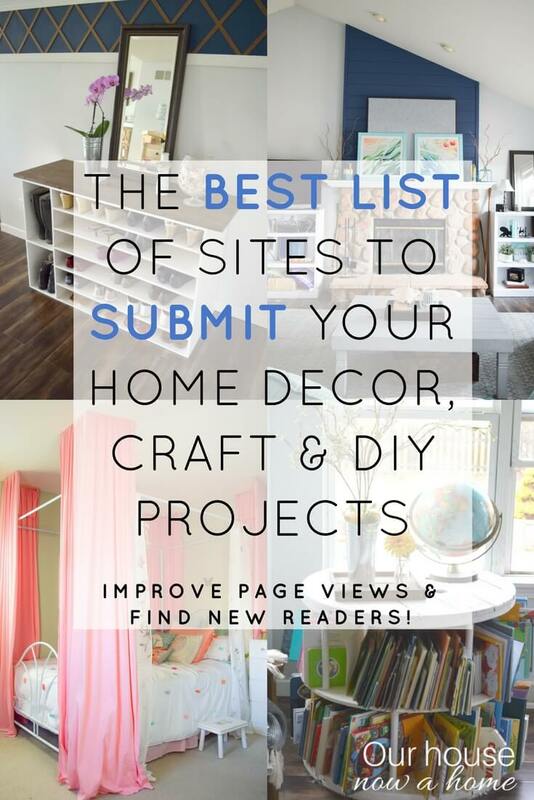 So many wonderful projects! 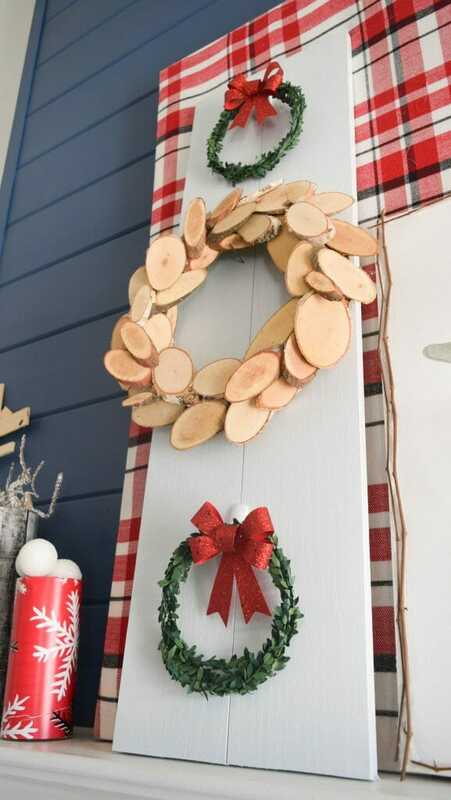 I love the wooden wreath. Happy holidays and I’m looking forward to seeing more of your Chhristmas dcor! 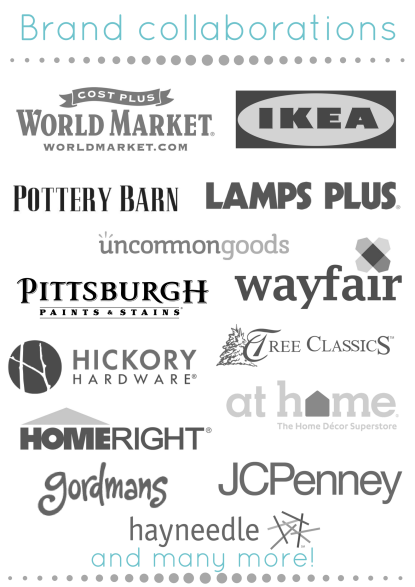 Joann’s is my favorite place to shop for my DIY projects. Gosh, you have some adorable ideas! 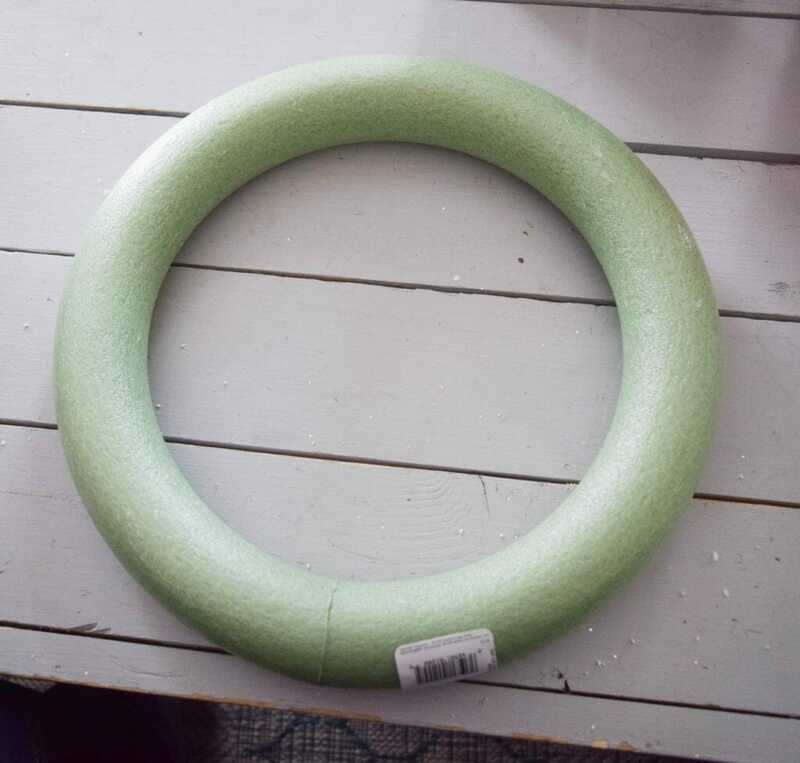 Joann’s has amazing project supplies! I am so happy you liked my decorating ideas! I haven’t begun the decoration process yet. I’m glad I haven’t either! This gives me some better ideas than what I had! I am so happy you found some ideas to use! I love seeing how people decorate their mantle’s at Christmas! And yours is so pretty. 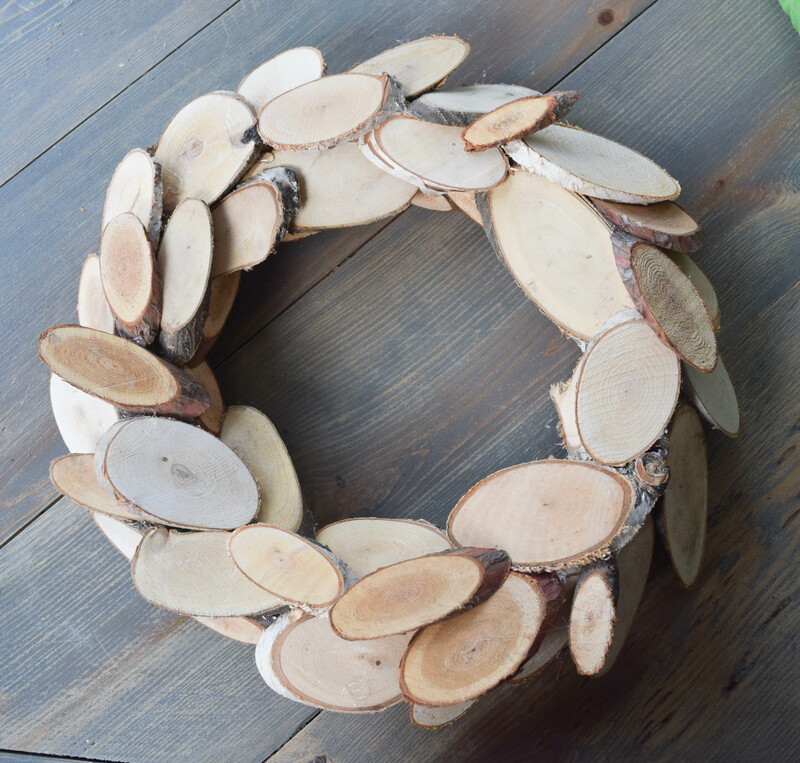 I love the wooden wreath, I’ve never seen anything like it before. You’re so creative!! Thank you so much! I love decorating my fireplace mantel! I’m so excited for Christmas! Your wreath turned out awesome! I always wrap the picture frame over my fireplace to look like a big wrapped present hanging on the wall. I am excited for Christmas too! This is gorgeous. Makes me wish I had a mantel to decorate! I would love to DIY some cute decorations. It’s fun and makes you take much more pride in it! I agree, decorating with things you make does make the space feel more special. What a beautiful way to decorate a mantle. I love decorating for Christmas it totally gives me this satisfied feeling. I am going to have try this. Thank you! I agree with you, decorating for Christmas is so much fun! I am going to have to try this for myself. There is really nothing more Christmas-y than a beautifully decorated mantle. I love to decorate my fireplace mantel for the holidays. I like to change it up every year. It makes a nice focal point. I like to change up my fireplace mantel decor too! Love all these brilliant ideas! 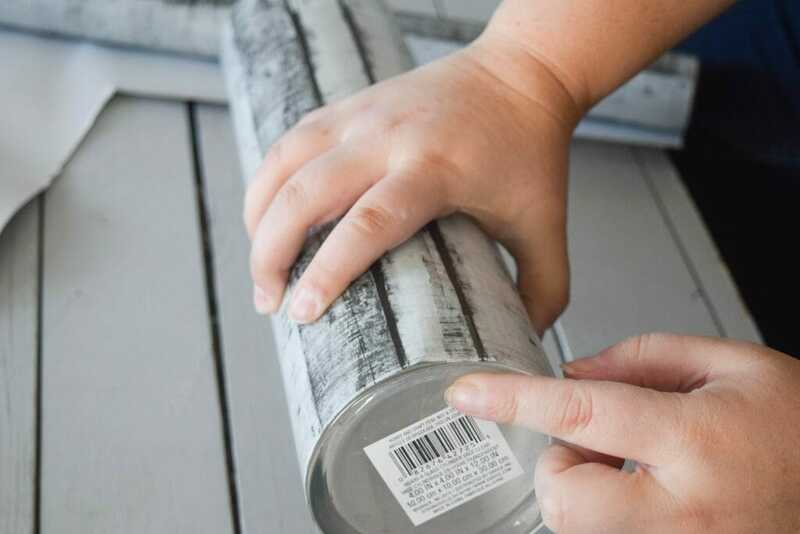 DIY is always a fun way to add a special touch. One day…one day I hope to have a mantel! I love it. It is beautiful and unique. 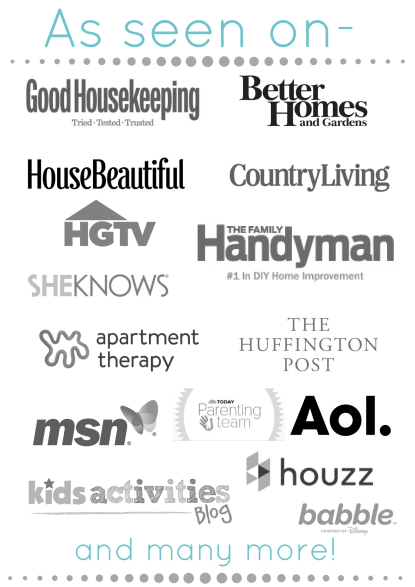 It’s proof that with a little effort and a lot of love we can fill our home with personal touches and lots of love. Thank you so much! Personal touches are the best way to decorate a home!